I know I’m not the only person who said this, but 2013 flew by. It was an incredible year for me and I’m a little sad to say goodbye to it. To honor it, I’m looking back on all of the amazing (and sometimes sad) things that happened during it, complete with lots of photos! 2013 started with this guy. 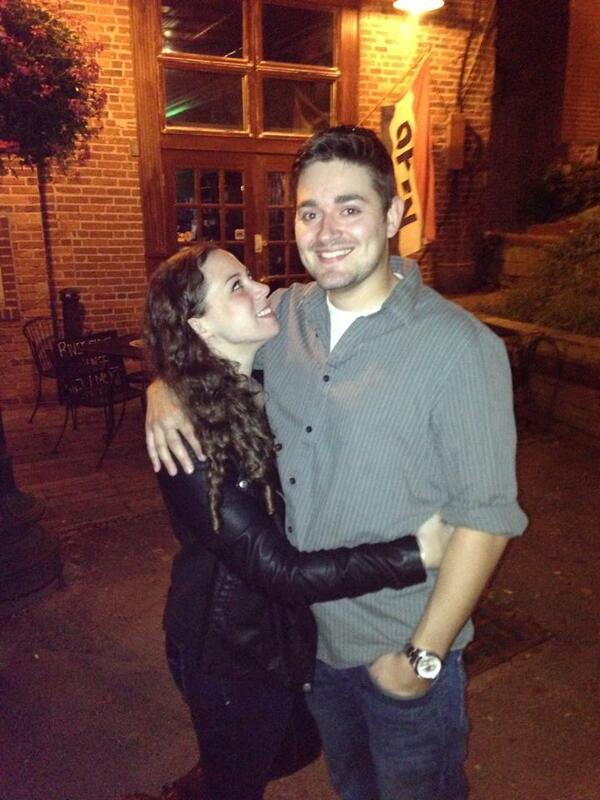 At the time, we had been together a whopping 5 months, but I already knew he was a different kind of special. The first moments of 2013! 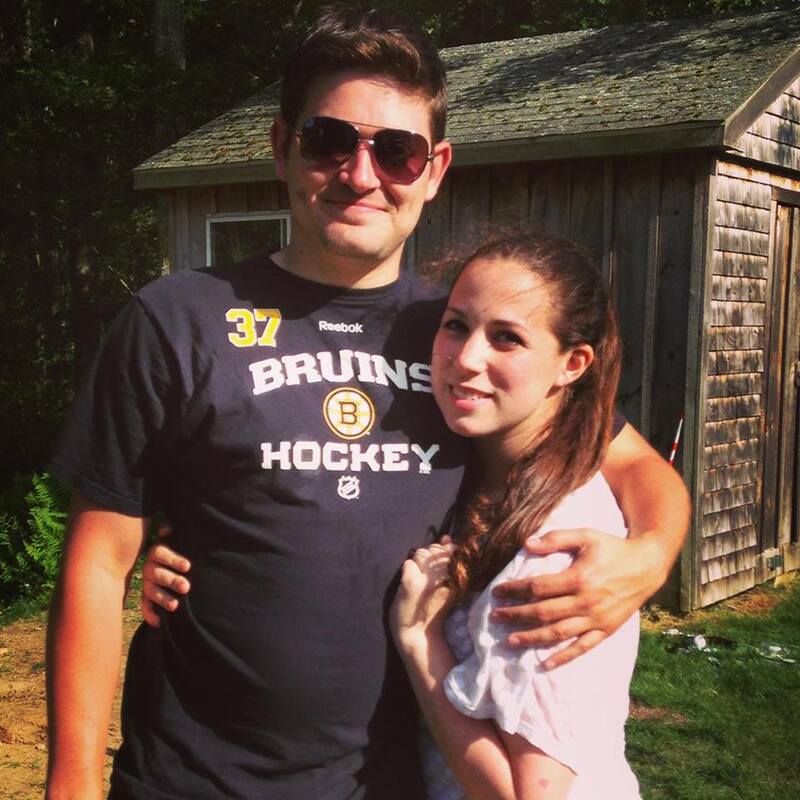 I continued to work for Boston.com as a sports production intern, covering everything from football to hockey, including the Bruins playoff run. 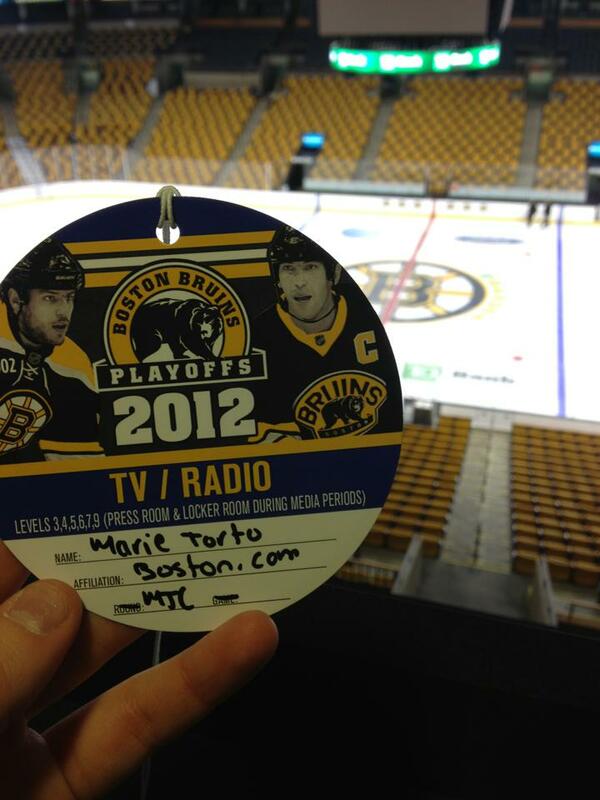 Watching games from the TD Garden 9th floor Press Loge is something I will never forget. I went to my first Muse concert and loved every second of it. May or may not have had many beers at this concert. 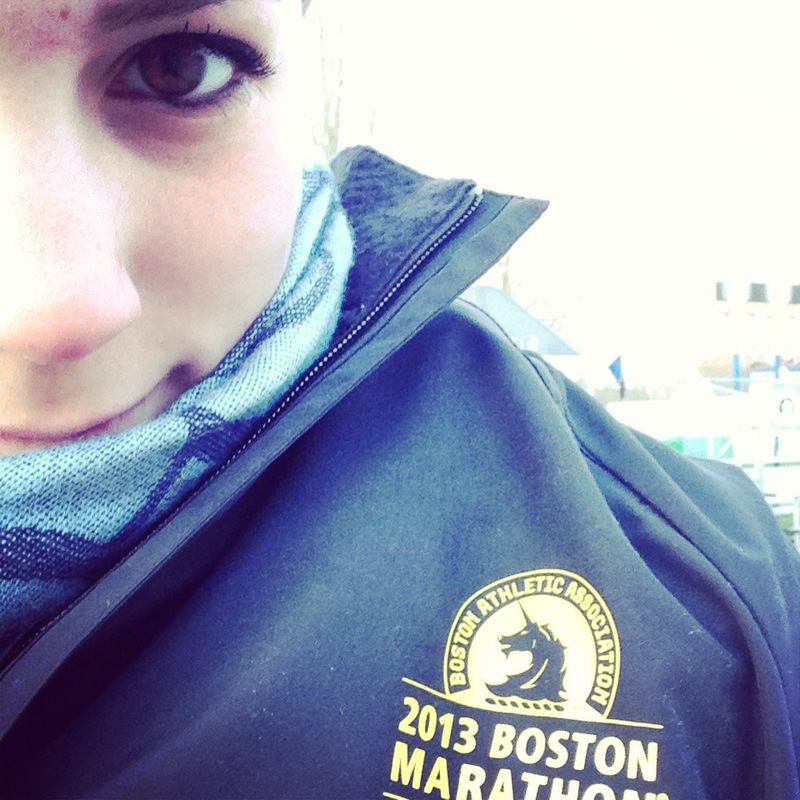 I covered the Boston Marathon and left the finish line minutes before the bombings. Thinking about that day still shakes me to the core. 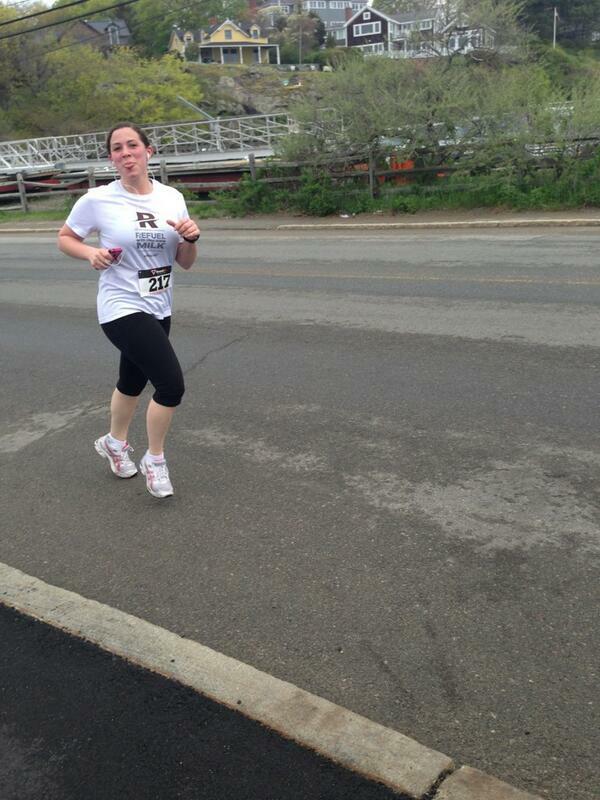 I ran 1 single road race: the Beach-to-Beach 5K in Marblehead for my third year in a row. Not my best, not my worst, but my only. Running and I weren’t close this year apparently. Nice bright red face there. 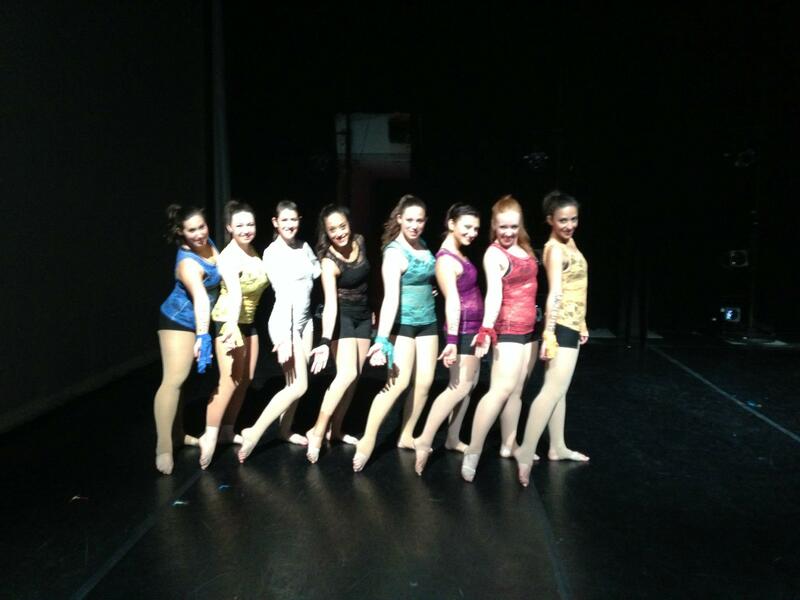 I danced in my 5th DanceWorks Boston show and choreographed my 5th piece, “World Spins Madly On“. 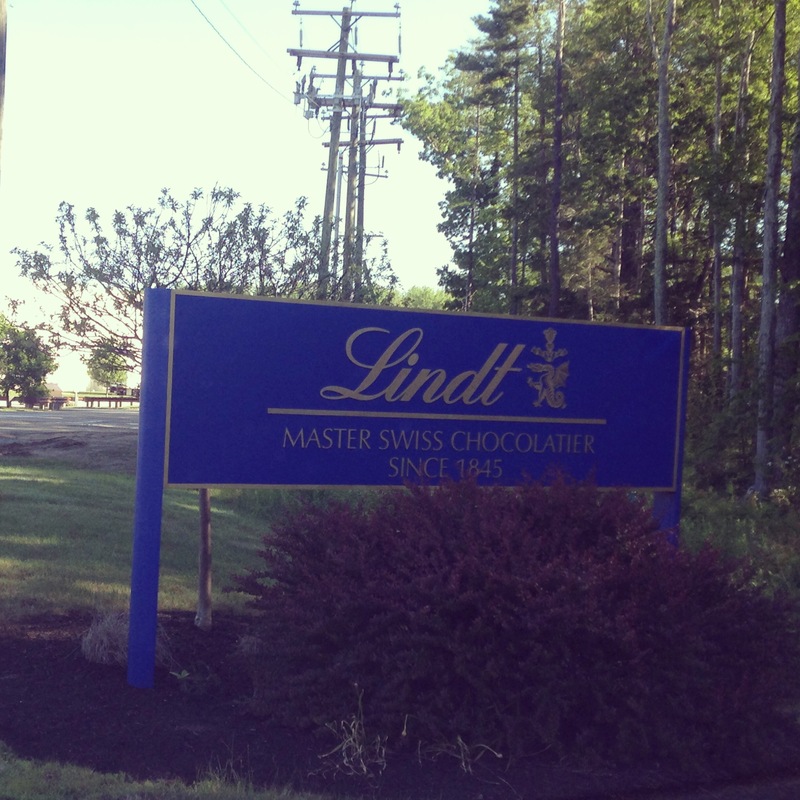 I ended the internship I loved on a high note and accepted my first full-time “big girl” job offer a few weeks later with premium chocolate company, Lindt & Sprungli, working in their USA headquarters in Stratham, New Hampshire. Yes, there is chocolate around me all day, every day. Lindt USA.. where it always smells like chocolate. BUT I managed to not gain weight in the 6+ months I’ve worked here. Happy dance. 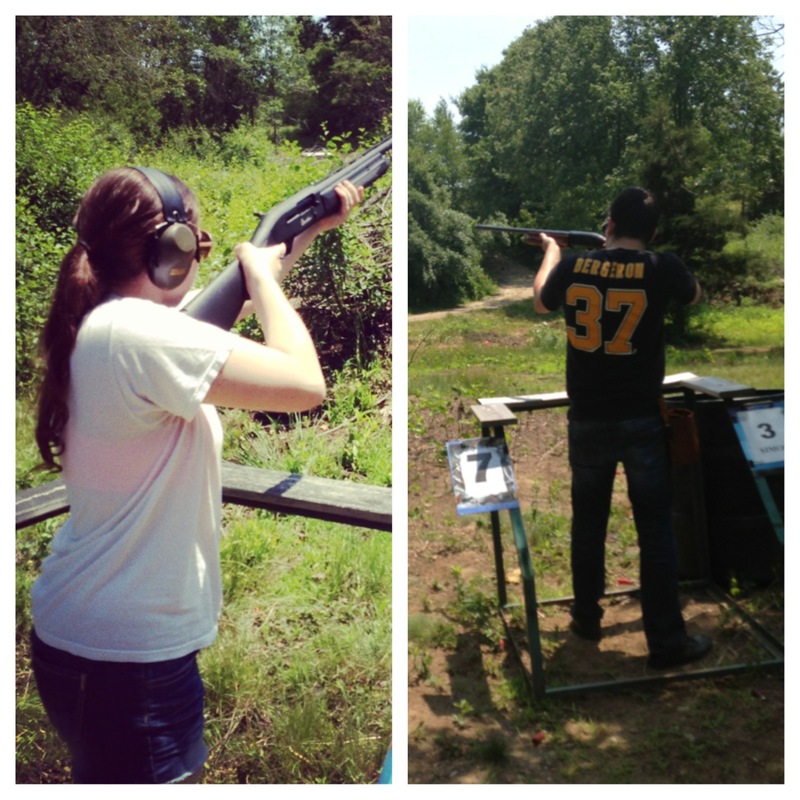 We knew each other a whole year… and that same weekend, I shot a gun for the first time. Irony? Nice knowing ya for a whole year! Pretty cool even though I didn’t hit a single disk thingy. 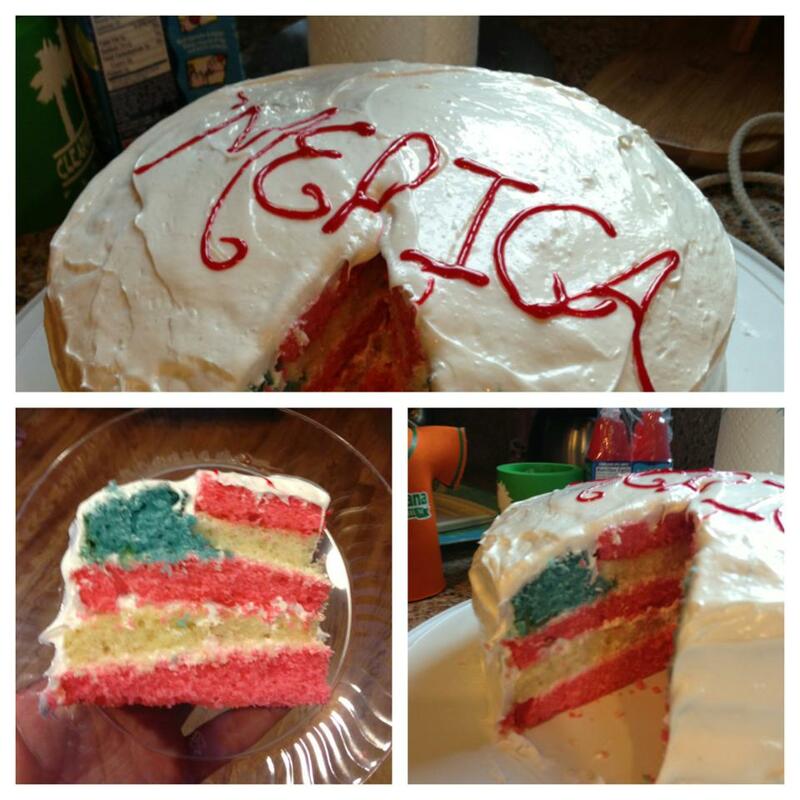 4th of July was complete with this awesome ‘Merica flag cake. 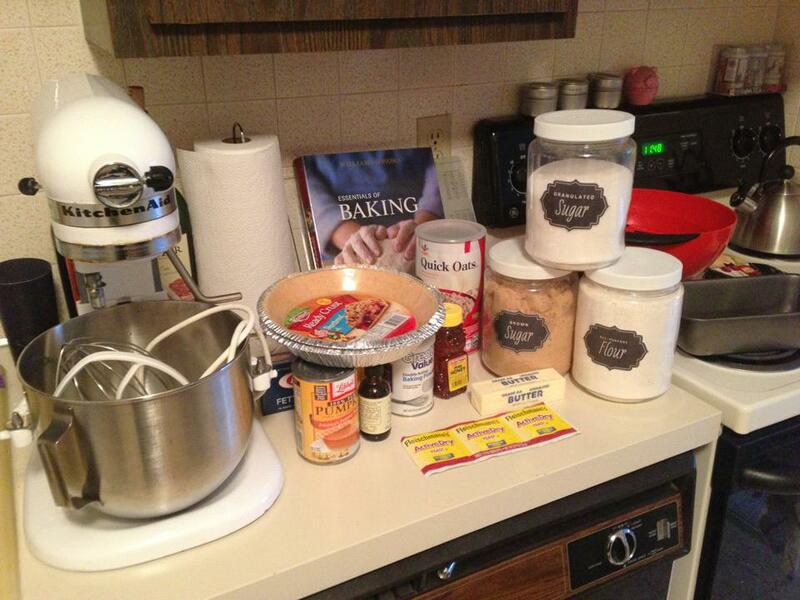 I can’t wait to make this again! I turned 25 in true 25-year-old fashion. 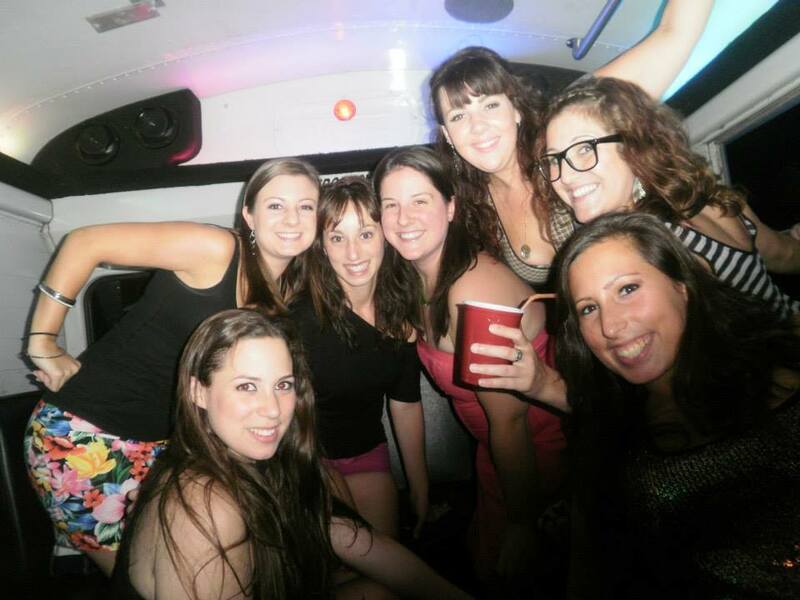 On a party bus with my friends. I moved to a different state (New Hampshire) and in with this guy. Putting in contact paper like a pro on our first night! So cute & crafty. Salt dough with help from Sean’s mom! And celebrated being together a whole year. 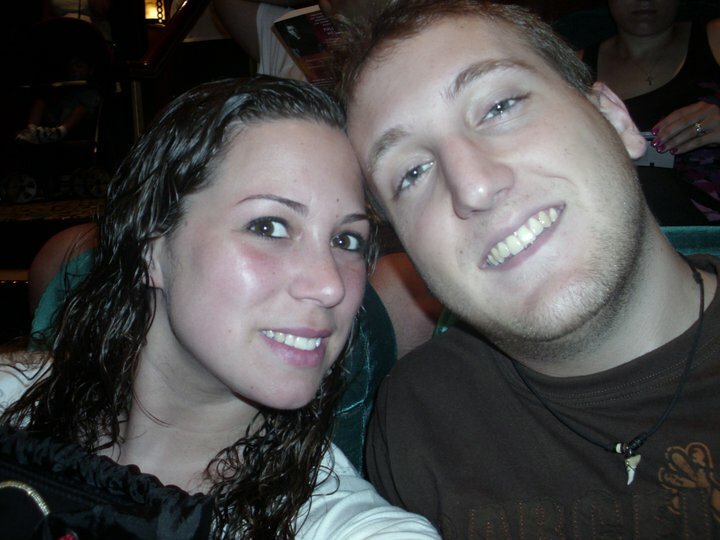 We road-tripped to Gettysburg, Pennsylvania to visit Sean’s sister Chelsea and her boyfriend Scott. And had an unbelievable time. 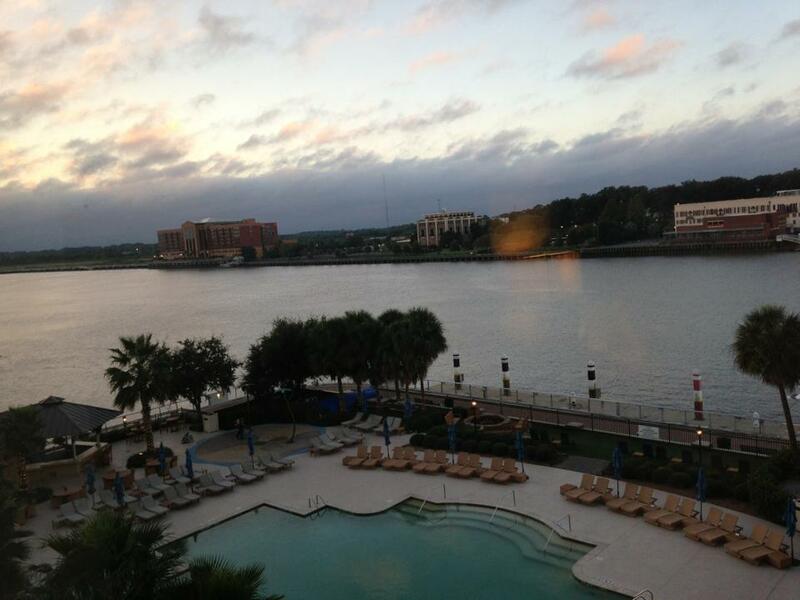 I went on my first real business trip to Savannah, Georgia. View from my hotel room. 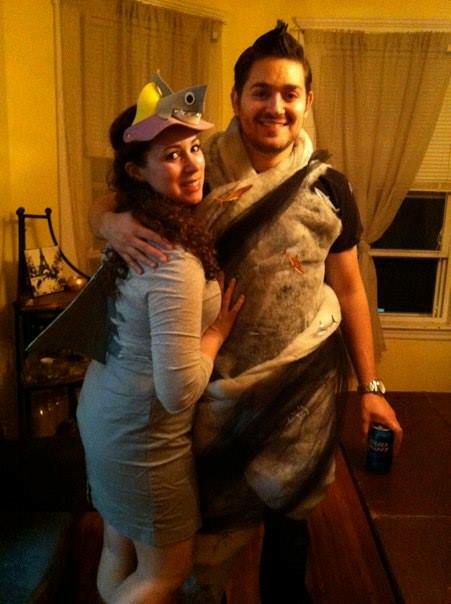 I dressed as a shark to Sean’s Sharknado for Halloween. 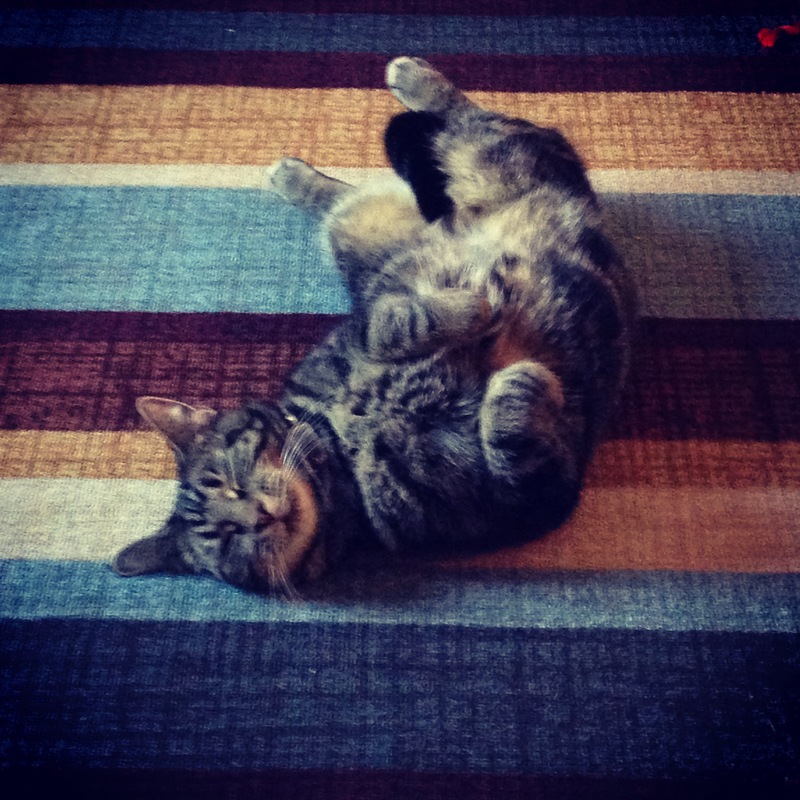 We went to the MSPCA at Nevin Farms’ “Cat Adopt-a-thon”, rescued a beautiful 3-year old tiger-striped tabby, named her Sophie, and fell in love with her. How could you not love that little face? 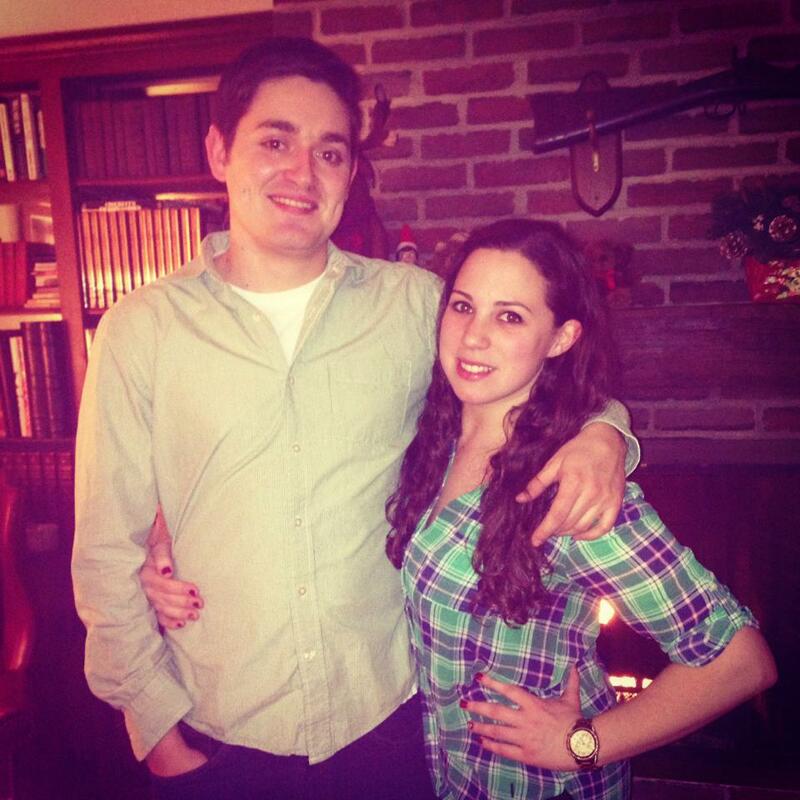 My family went to my cousins’ new house in Maine to celebrate Thanksgiving for the first time. Many hours of football and eating commenced. 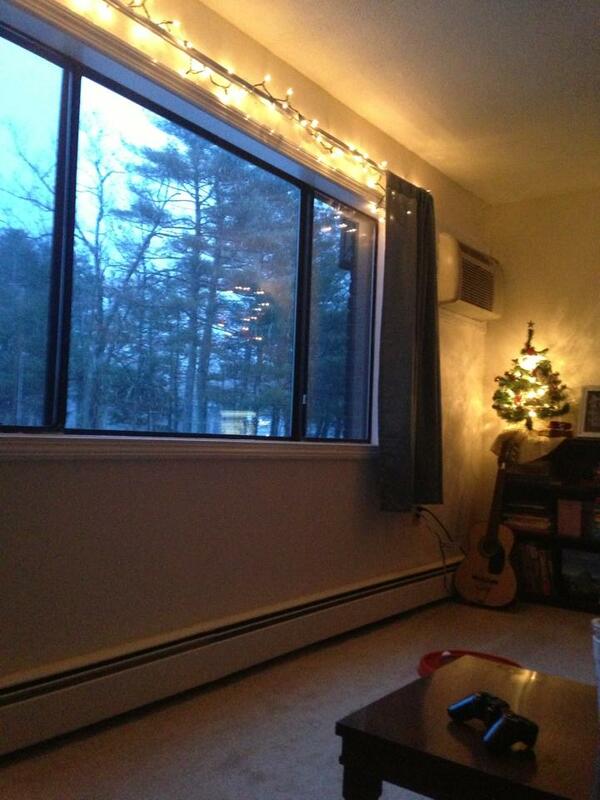 I got into the Christmas spirit early with twinkle lights and an American Girl doll Christmas tree. Next year, it’ll be much bigger. I had a wonderful Christmas. Traditional Christmas Eve photo! Also – I’m short. 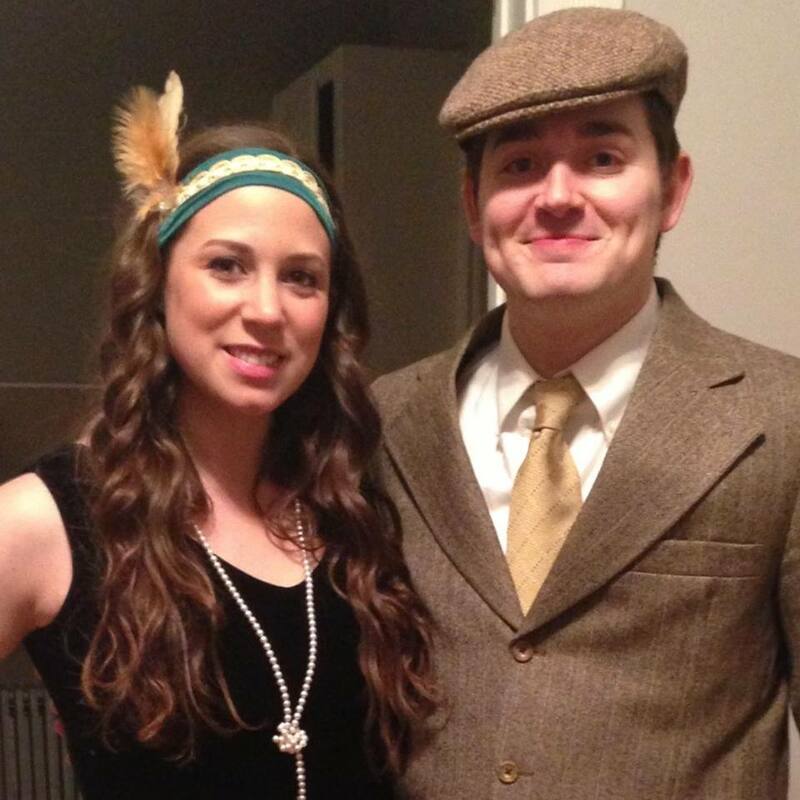 Circa 1920s for NYE! Hair courtesy of my new hair wand curling toy. 2013 was fast and fun for me, with so many memories, I probably missed a few. I danced, I laughed, I cried, I loved. I could not be more thankful or happy in the place I am in right now. Cheers to you, 2014. You have some big shoes to fill. I had much of this post written before December 17th. I am going to leave what was written originally as is but add a little something up here first to give a little more context to my 2012…. I feel this post is better late than never. 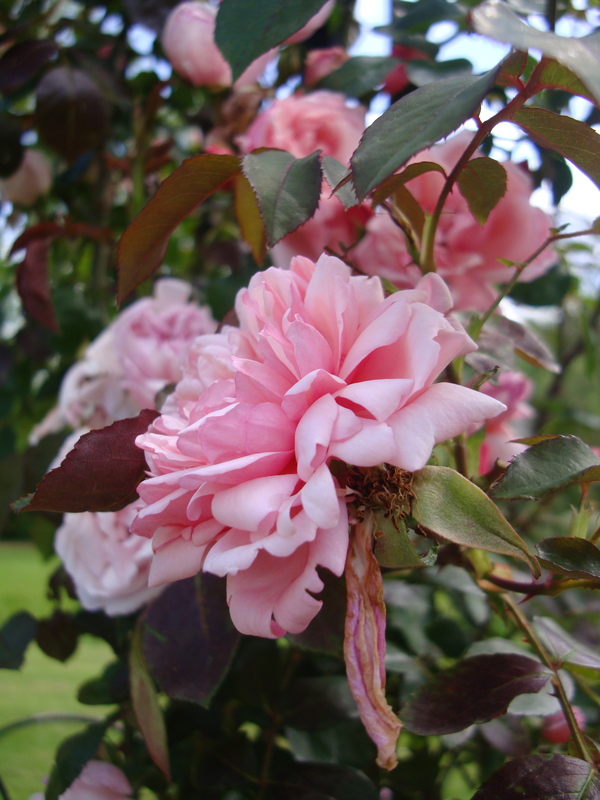 On December 17th, my grandmother passed away. It was sudden, unexpected, and devastating. Mere days before Christmas, a fatal heart attack that no one saw coming was ultimately to blame. Surprisingly, I managed to keep myself together for most of what followed, only breaking down in the hardest moments, trying with everything I had in me to keep my tears hidden. She was also stubborn, but in the kind of way that made you thankful for traditional things, like the exact right way to make a turkey on Thanksgiving and why, to this day, I sit closer to my steering wheel in the car than is really necessary because “it’ll protect me.” No, it will probably make things worse, but things stick when you’re a little kid. I miss my Nuna more than I can possibly say. I am thankful that I had her for almost all of 2012, but 2013 and on will not be the same without her. My little sister, Nuna and me… Little kid fro and all. Now, onto what I had written before. 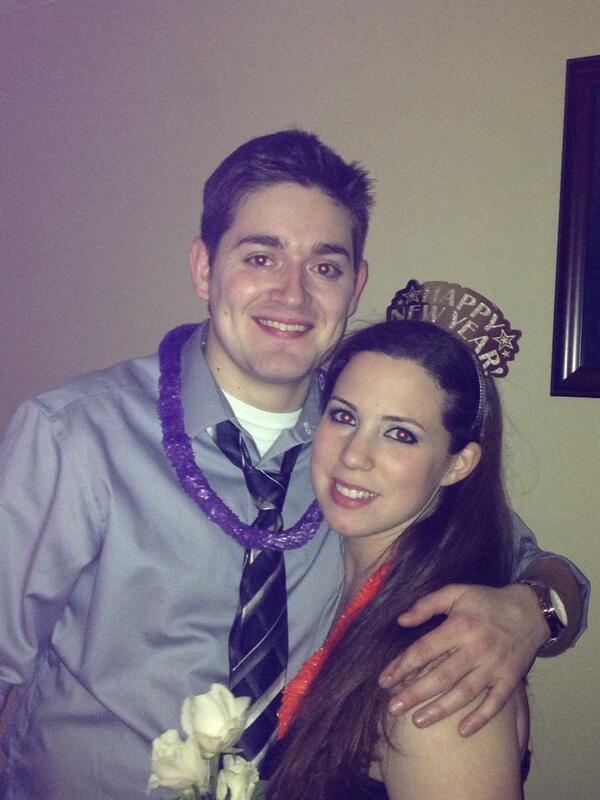 Happy New Years everyone! Remember when I wrote the post, “2012 Will be Great?” Well, it was. But not before it was absolutely horrible. 2012 became a year that I never expected. Last December, I had my whole life planned out. A special relationship to me ended and I thought things would never be the same. They aren’t – they’re better. Things change, people change, and everything happens for a reason. I think I’ve finally grasped that concept. But 2012 had many great things. Many amazing things. Allow me to tell you about them. – I ran my first 5-miler. 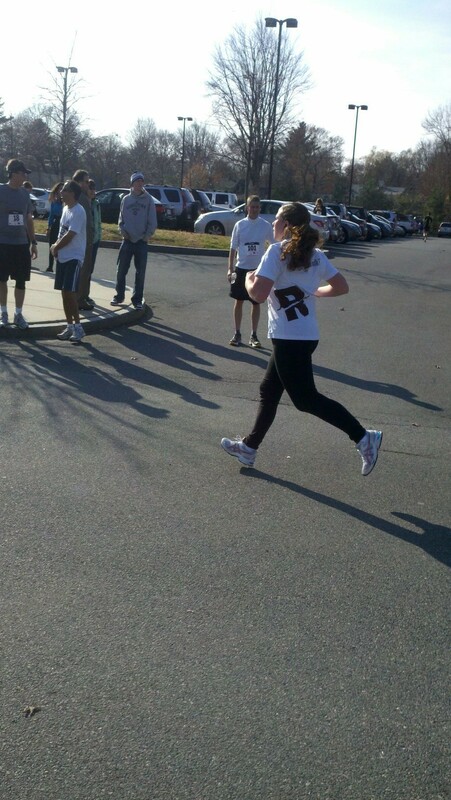 First 5-miler on New Years Day 2012. 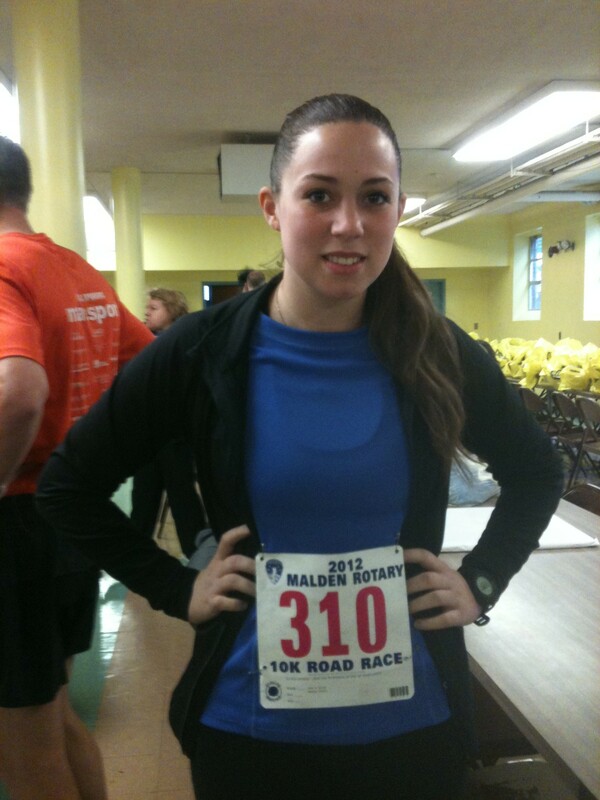 – I ran my first 10K. 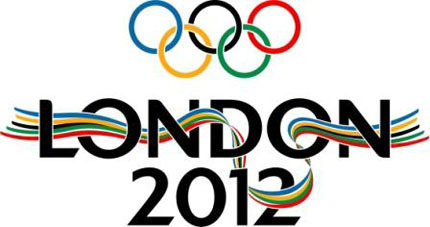 – I spent my summer at the London Olympics. 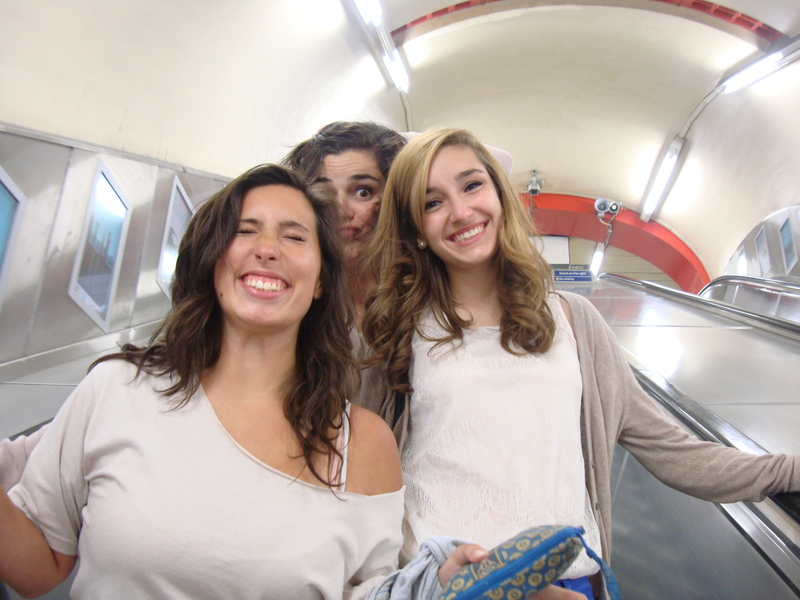 London2012… The best summer of my whole life. – I turned 24 on the top of the Eiffel Tower. – I watched two of my childhood friends get married. 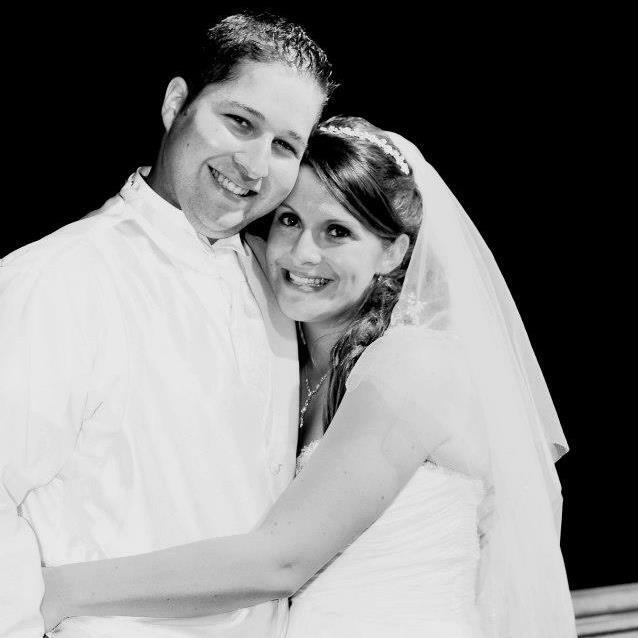 Photo courtesy of the Groom’s Facebook page. – I met a guy I would get to know while I was away for 7 weeks… and fall for him… hard. This is my boyfriend, Sean. I suppose its time for all of you to be introduced. 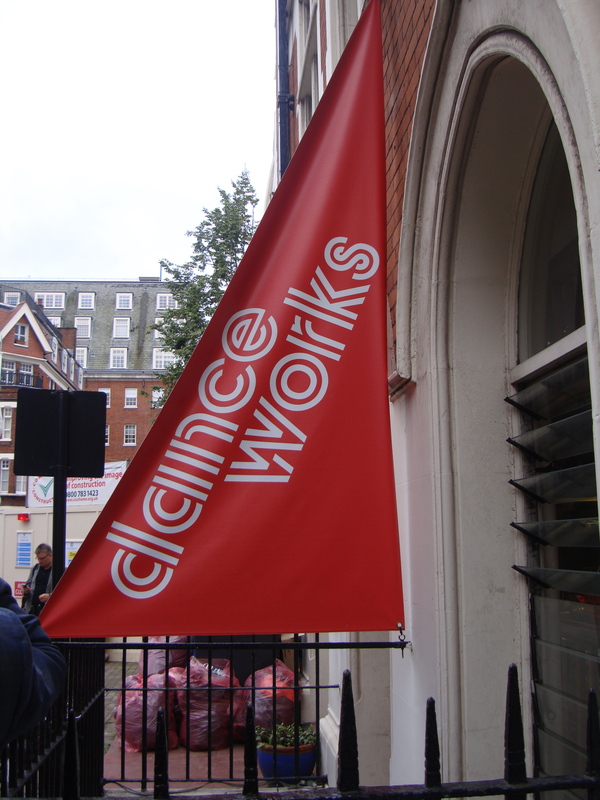 – I was in 2 DanceWorks Boston shows and choreographed 2 routines for it. My routine, “Deadly”, featuring the 7 Deadly Sins. The face of a Master. You know you’re impressed. 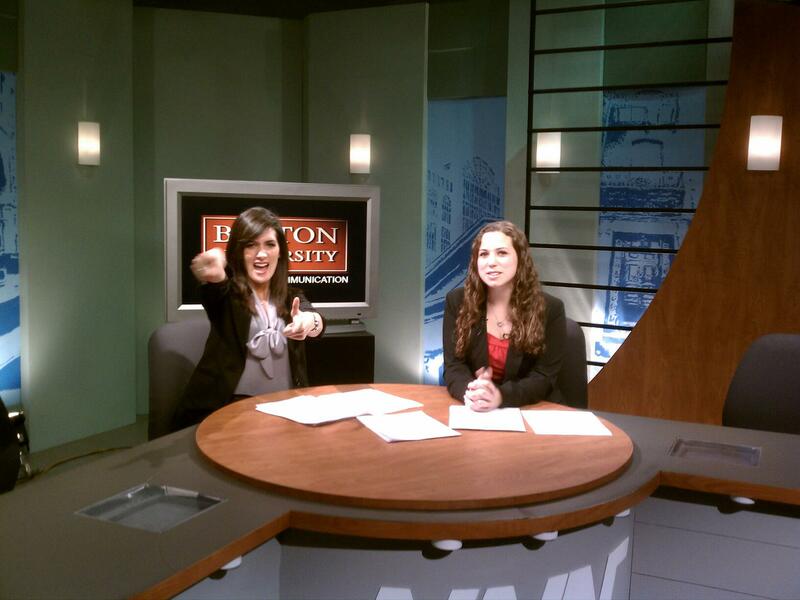 – I got a part-time, paid internship as a Sports Web Producer at Boston.com. – I changed in a lot of ways. When I look back on 2012, I realized how much my life has changed and I honestly don’t think I’d change a single second of it. Even though parts of it were incredibly difficult and there were times when I wanted to give everything up and just live in my own misery, I pulled through it. I am happier than I have been in a long time. 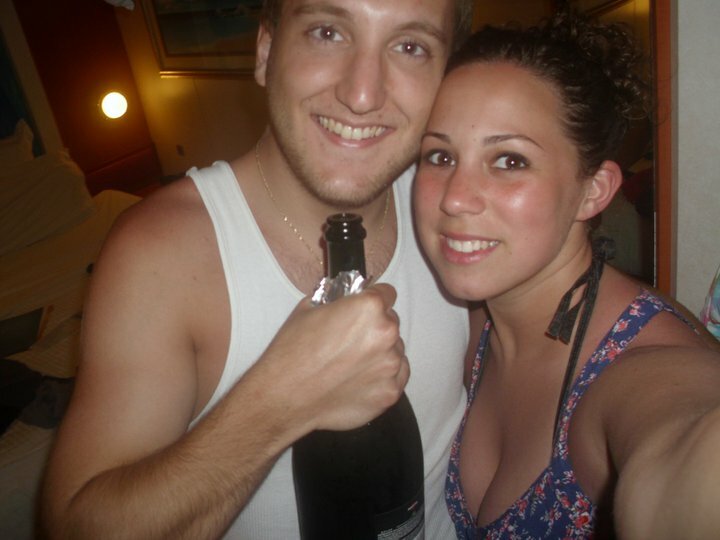 Here’s to 2013 and everything it brings. I haven’t really made any New Year’s resolutions but here’s one: blog more. Good plan. Apparently I took a completely unscheduled hiatus from blogging and now all of a sudden, it’s November. I never really meant to stop blogging for all this time. Life just got away from me there for a while. If you’re just dying for a not-so-short-but-still-sweet recap of what’s been going on with me for the last 3 months, buckle up… you’re in for a bumpy ride. I last left off leaving for Paris. It was incredible. I spent the first few minutes of my 24th birthday on the top of the lit up Eiffel Tower and it was nothing short of spectacular. Keesa, Matt, Justin and I spent the rest of the day lounging out front of the Eiffel tower with two bottles of wine before getting on a plane back to London. Happy 24th Birthday to me! The Eiffel Tower was my present but I couldn’t fit it on the plane home. Darn. 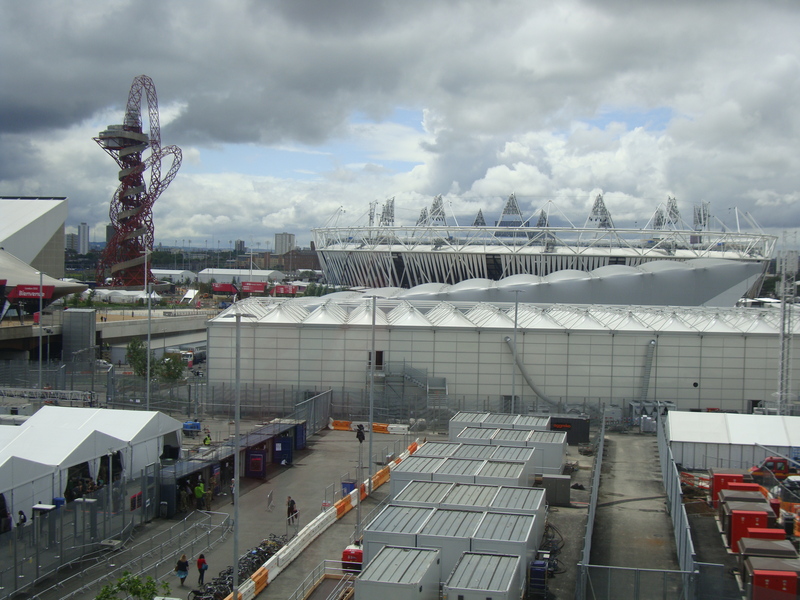 Fast forward a few days…the London2012 Olympics were beginning, I was knee deep in school and internship work and life was surreal. Though stressed, I was happiest than I had been in months, partly due to completely unrelated circumstances that I will get to in a bit. So the Olympics… yes, well, let’s just say I’ll never be able to watch them from my couch again. Yes, I will be finding a way to get to Rio in 2016, hopefully by then I’ll be an Olympic correspondent for… something… anything. Just get me to Rio. 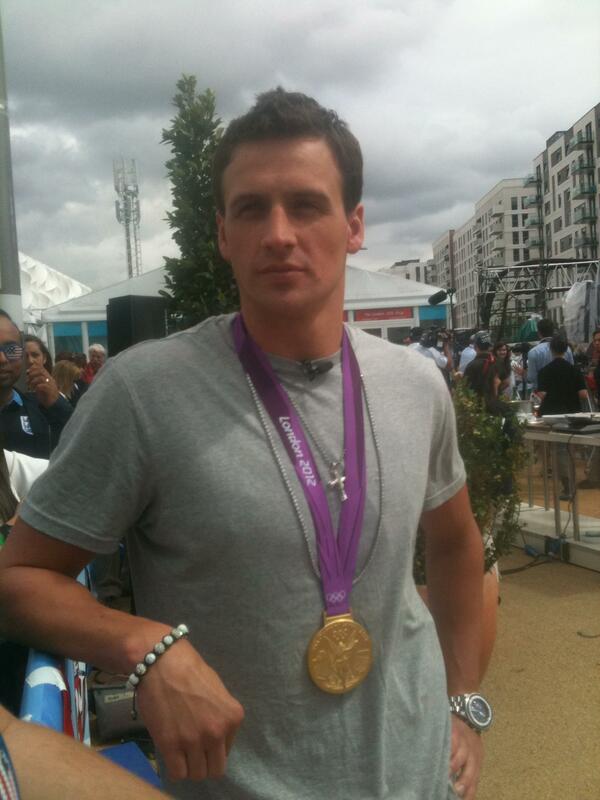 Yes, that is Ryan Lochte and yes, I was that close to him. 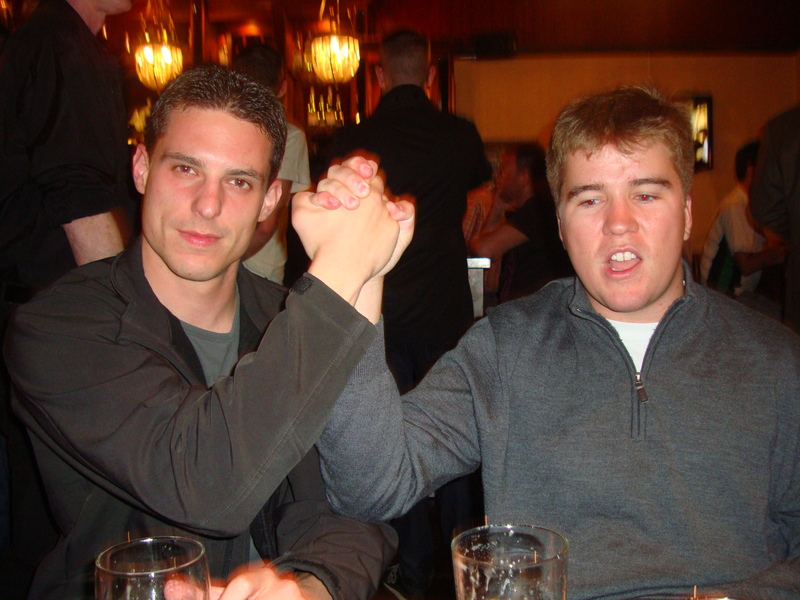 We chatted… Let’s just say its a good thing he’s an Olympic athlete cause the kid’s got rocks in his head. So let’s back up a bit… before leaving for London I was pretty much a miserable wreck. Long story short, my boyfriend of a very long time broke up with me. I was blindsided, devastated and, in the midst of the worst and hardest semester of my entire life, fell completely apart. I considered dropping out of school, I considered giving up London, I considered being a moping, miserable person for the rest of my life. And for a few months, I was. But I stayed in school and committed to London because let’s be real here… what was the point of throwing away the $60,000 I had already spent on my grad program and the trip of a lifetime? There wasn’t. I buried myself in my school work, dance and being with people who really did love me. I cried every day, multiple times a day for weeks. I listened to sad music, ran a lot of lonely miles and talked to anyone who would listen. I didn’t believe it when people told me that life would get better, that there was someone out there who would love me unconditionally, someone who I was supposed to be with. This was in March. 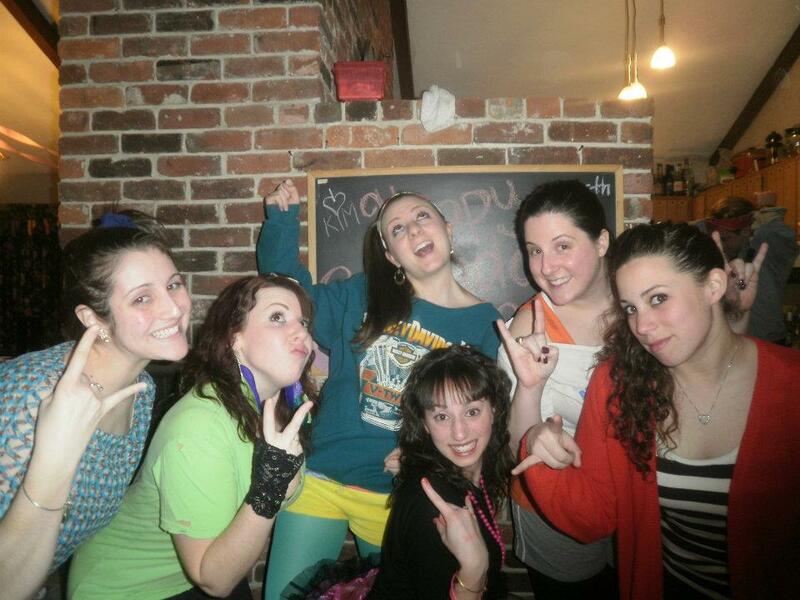 My BU friends took the brunt of the emotional roller coaster simply because I saw them every. single. day. This dinner was for cheering me up. I also carbo-loaded for my 10K the next day. It was awesome. A few months went by and soon, I wasn’t crying anymore… or at least not as much. I finished my semester with one of the highest GPAs of my entire academic career and was now looking ahead to the summer. London: getting away, doing everything for myself, letting nothing hold me back. And I was scared as all hell to go away for 2 months so that pretty much trumped all other emotions at the time. This is how I get good grades. No, but really. 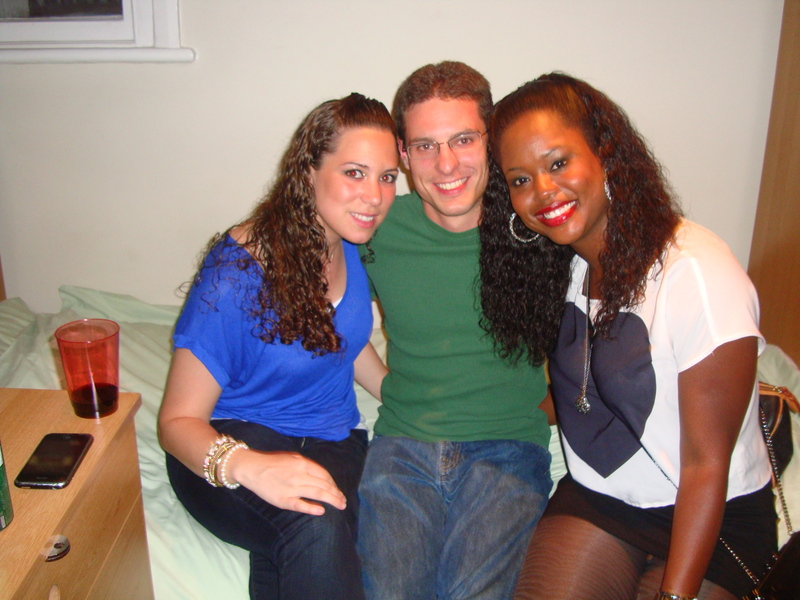 And Keesa was one of my roommates in London. Best matchup ever. June rolled around and soon, I was mere days from leaving. But before I hopped on a plane to Europe for the summer, my family and I went to the wedding of two of my very good childhood friends. 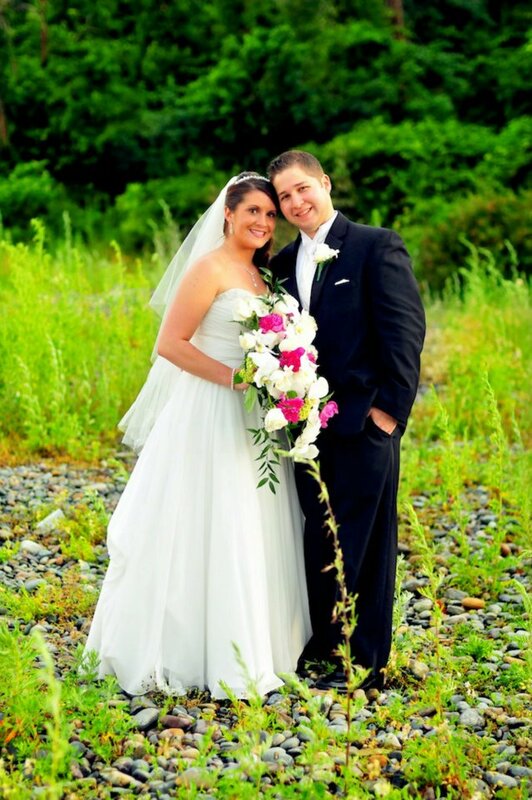 Together for 7 years, throughout high school and college, they got married in our church and had a beautiful reception on the water in Nahant. Though slightly emotional, it was one of the best nights I had in a very long time. 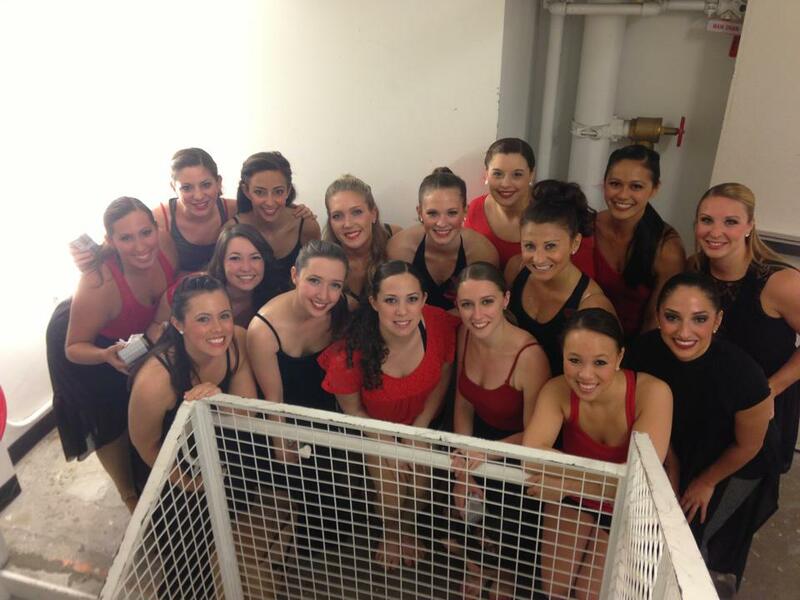 Photo courtesy of Sarah’s Facebook…. 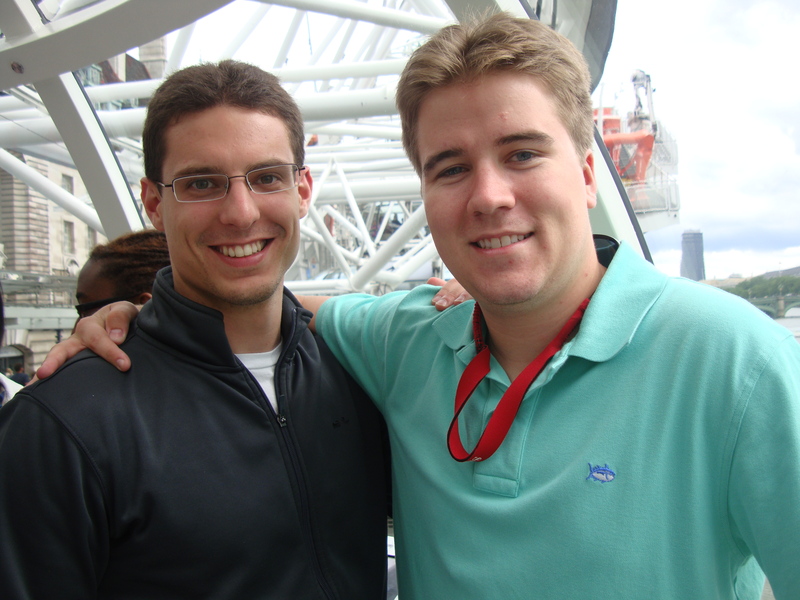 I even met someone… but more about him another time. Spoiler alert: This is where the previously mentioned “happy, unrelated circumstances” comes into play. 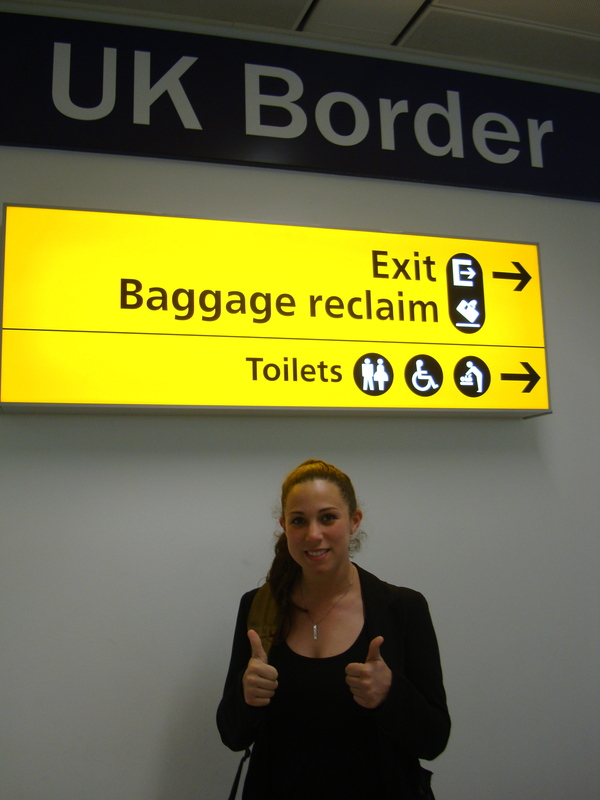 Three days later, I boarded my plane, took off to London and went to the Olympics. Is that the end of the story? Hardly. Let’s just say I not only got to go to the Olympics this summer, but I also got to know someone very special from 3,000 miles away. But I’ll leave it there for now. 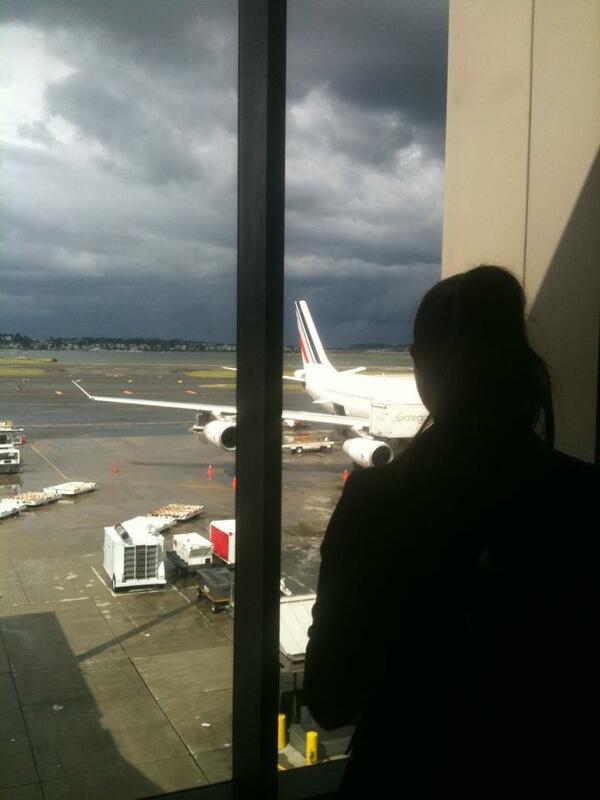 My Summer in London: Off to Paris! Tomorrow morning, at 3:20am, a bus will take me, Justin, Keesa and Matt to Luton airport. I don’t know about you, but I only know what 3:20am looks like because I’m usually up on Skype or g-chat until 4am… But to actually have to be a functioning human being who is traveling to another country, I should probably take a nap or go to bed super early or something. We’ll be spending the next 4 days in the beautiful city of Paris. Think of it as a mini vacation in the midst of my program here. We had spent the past 2ish weeks taking a special topics class on the Olympics, took our final this morning (aced it) and I have one package already done that should be posted on boston.com sometime next week. We’ll be going nonstop for the 3 weeks after Paris in full-blown internship mode so after already being here for a little over 3 weeks, a getaway to France is more than perfect. The last time I visited Paris, I was 9, and as much fun as I’m sure I had there being hauled around by Len & Shirl, I am bouncing-out-of-my-chair excited to get to experience it again in a different way. The four of us are even considering a day trip to Versailles on Saturday. And the best part? 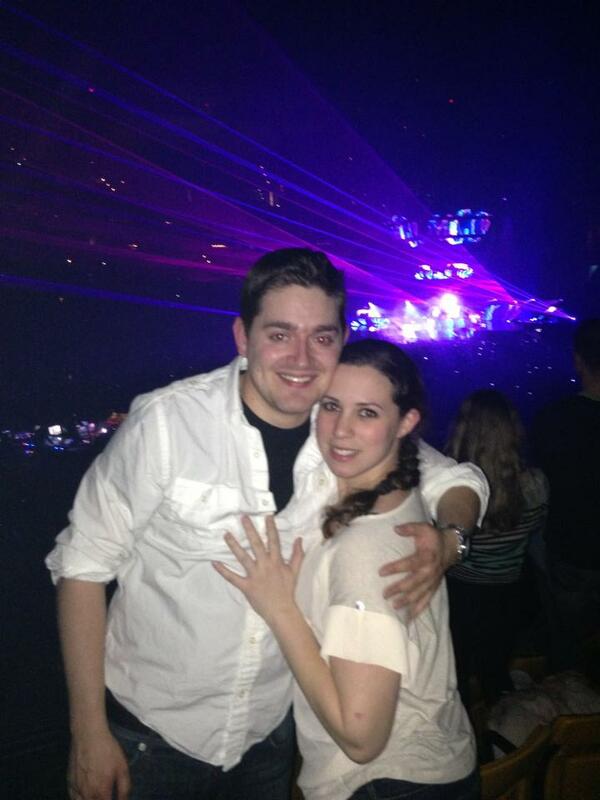 It’ll be my birthday while I’m there… Oh hey, how did you spend your 24th birthday? 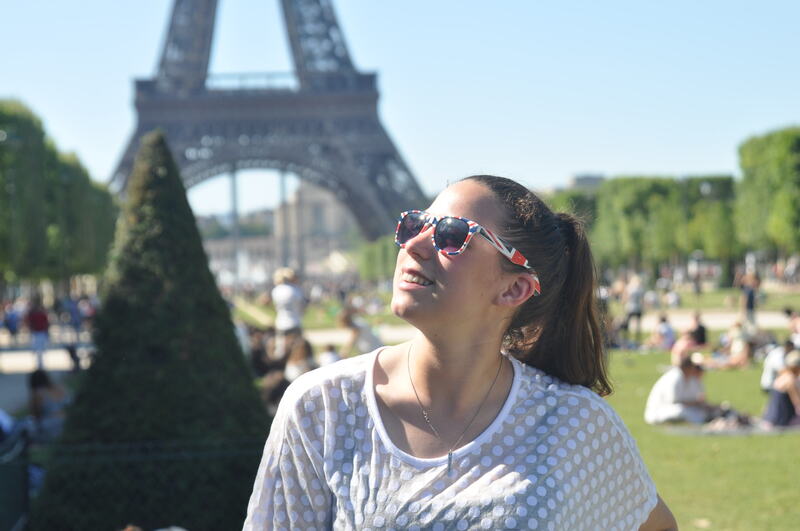 In Paris… no big deal. So the next time you see me, I’ll be a little older, probably none the wiser and hopefully full of good French wine. Always gotta have wine..
Hello again! 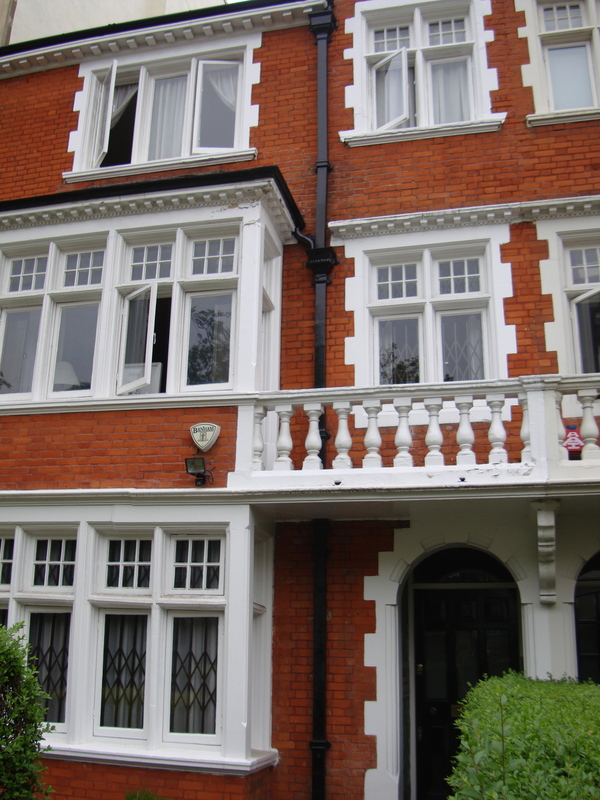 This time from Courtfield Gardens in Kensington. 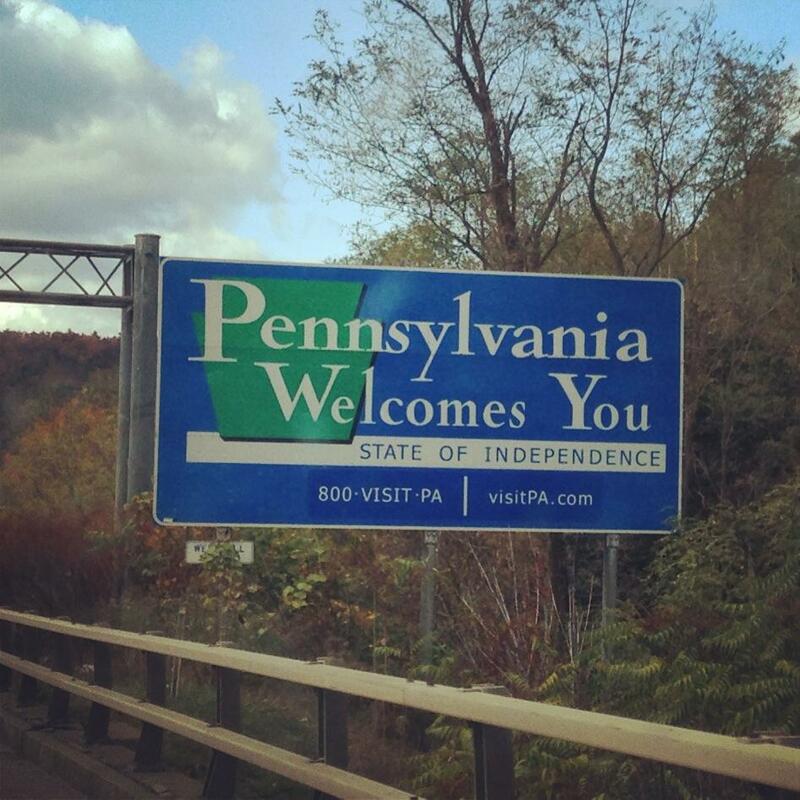 Home Sweet Home until August 14th! 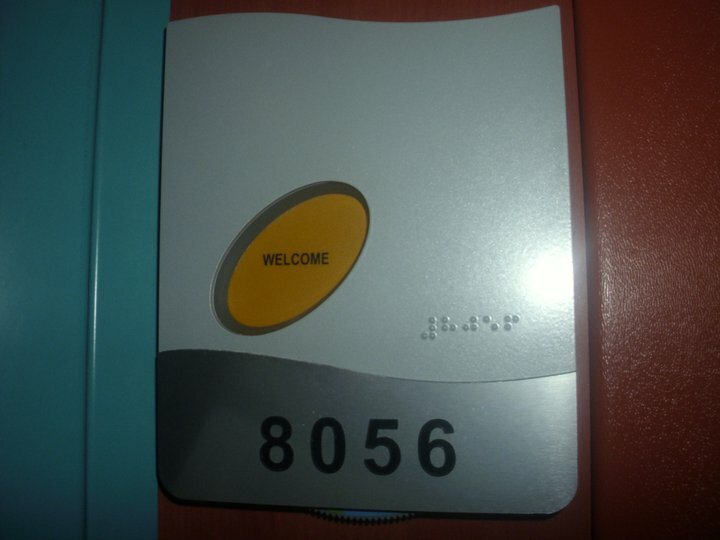 I moved into my flat on Monday after a weeklong vacation with my family. 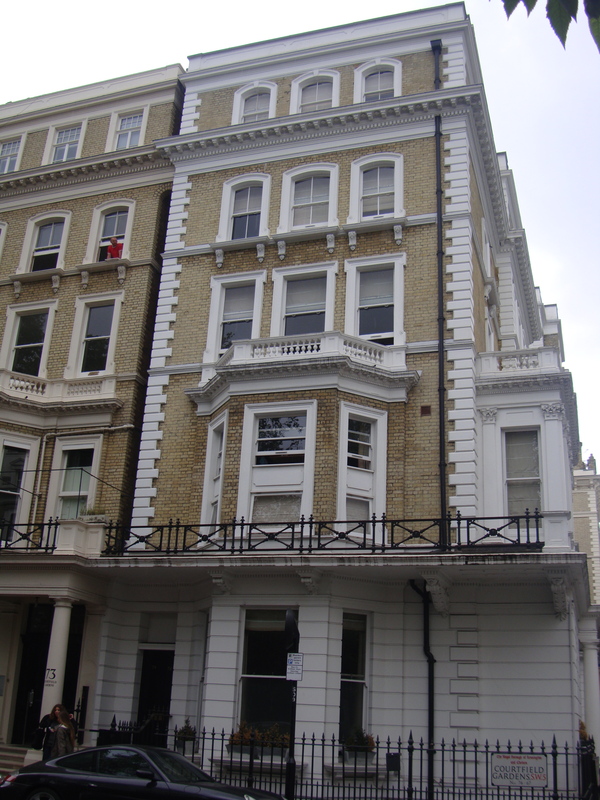 Courtfield Gardens is a mere 25 minutes away via tube and I quickly settled into my 3-bed room with two roomies, our own bathroom and an accessible kitchen. It’s a lot bigger than it looks and I love it. Essentially, I’m putting together a presentation about Women and the Olympics, shooting and editing a ton of video and stills, and have my first few weekends free to travel Europe and explore all that London has to offer. Instead of sleeping after class, because let’s be real here…. I’m hardly doing any of that for one reason or another… I decided to go down to a local dance studio for an advanced contemporary class. Not only were both the class and the instructor amazing (I was drenched in sweat within the first five minutes and could hardly move the next day), it had a familiar name making me feel right at home. 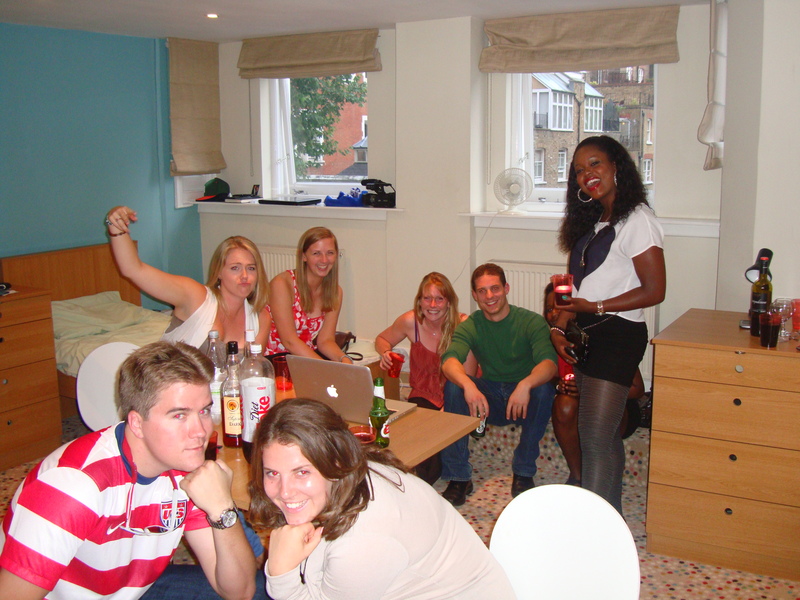 When I got back from the class, my friends were ready to get a drink and check out some of the local nightlife. We decided on the Courtfield Pub about 10 minutes from our place. The only boys in the program… they have it made. 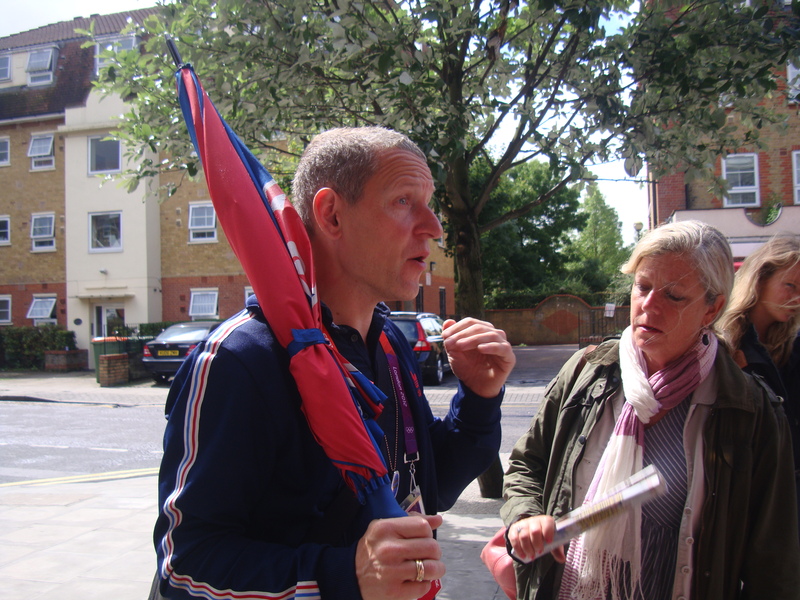 On Wednesday, our group made the journey on the tube to West Ham to take an Olympic walking tour. This is Pepe, our tour guide. He really enjoyed his stories but we learned a ton. 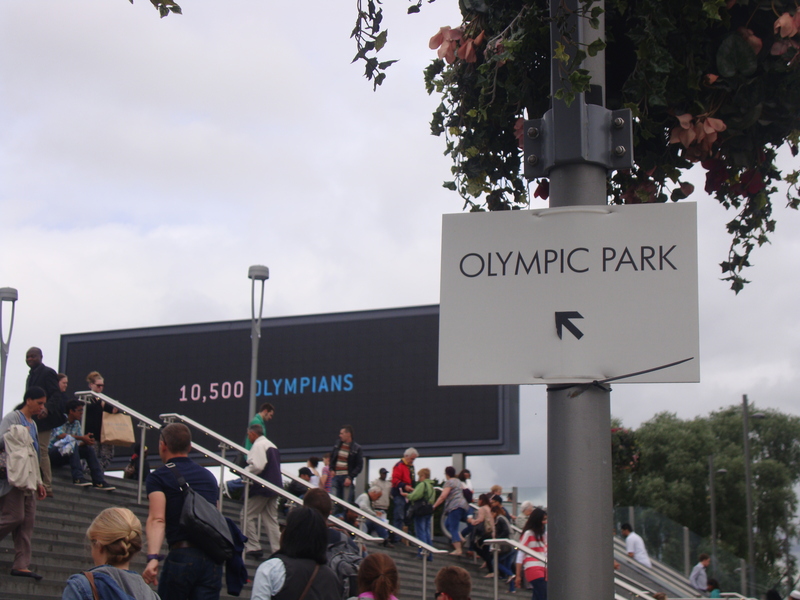 We walked for about 2 hours, learning about everything from past Olympics to how and why London was chosen over Paris for the 2012 Summer Games. Apparently everyone thought that Paris would get it over London, including all of England, and when it was announced that Paris lost, the French didn’t take it so well. Go figure. 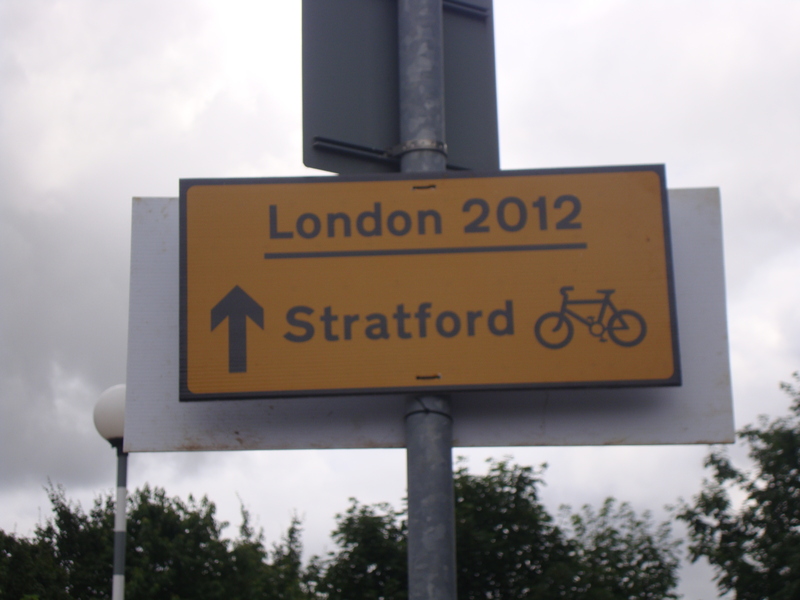 To see the Games, get off at the Stratford tube station and go straight to the park. You’re welcome. 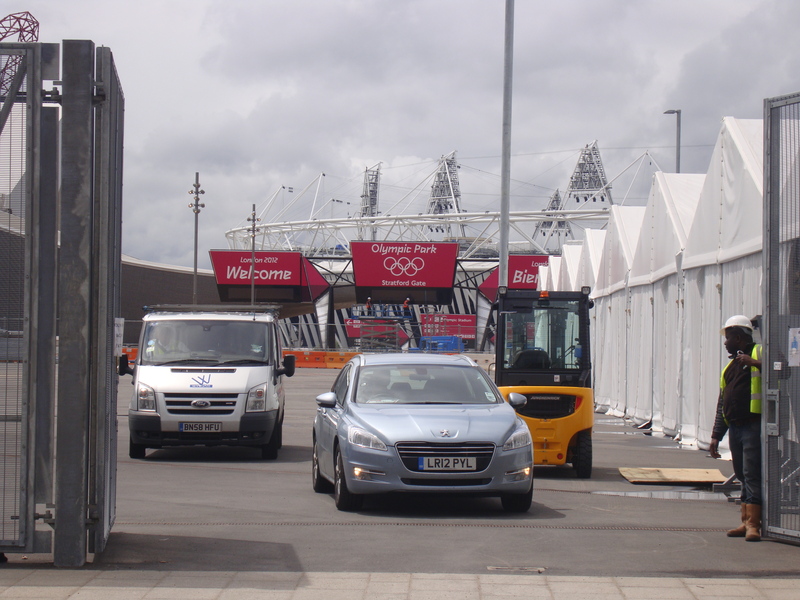 For now, the area surrounding the Olympic Park is still pretty accessible but within the next few weeks, security will tighten and getting anywhere near the entrance will be impossible without tickets or the highest security clearance. Doesn’t get more badass than that. 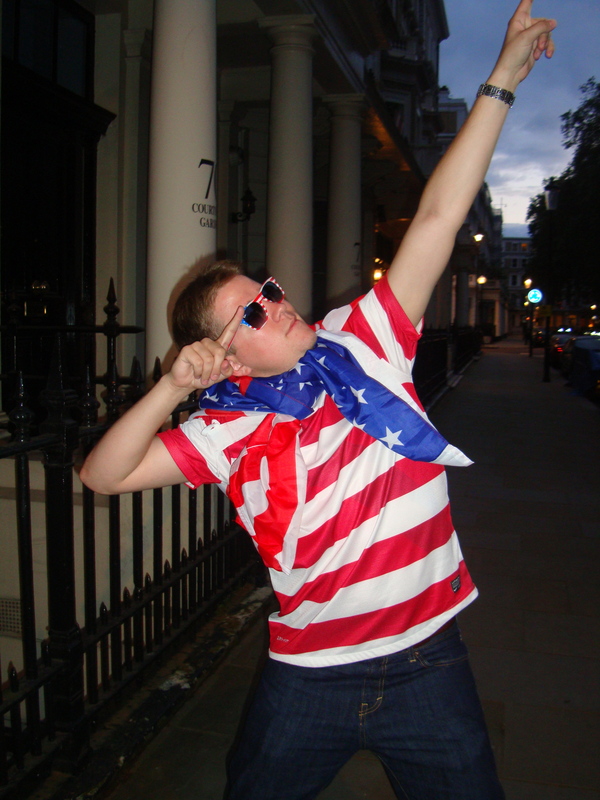 Since it was the 4th of July on Wednesday, there was no way that we were going to not celebrate, despite the fact that we’re in England. If anything, the irony made it that much better. We got ready, had a drink or two, and found a bar in Covent Gardens called Roadhouse that we heard would be full of other Americans we could party with. It was.. and we had a blast. 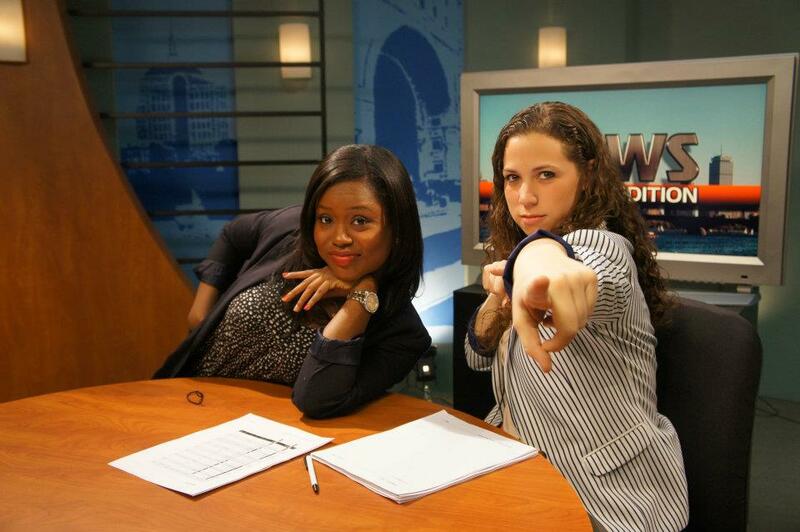 Future journalists of America celebrating America. Just kidding, Justin. We love you! Matt decided to bring the American flag along for the ride. It was, by far, the best 4th of July I’ve ever had. Despite staying awake until an ungodly hour, we decided to dedicate the next day to being as touristy as possible. Our solution? 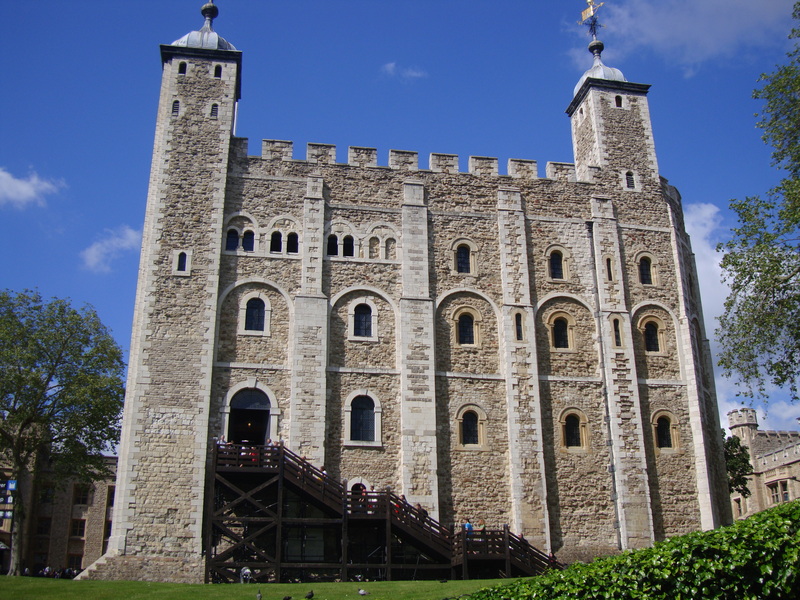 The Tower of London. Torture chambers, the Crown Jewels. Classic England. 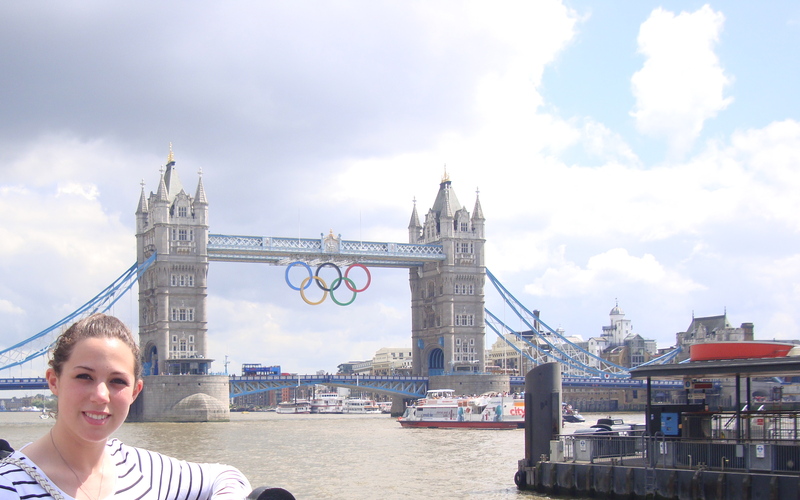 Before going inside the fortress, we checked out the Tower Bridge, beautifully adorned with the Olympic Rings. 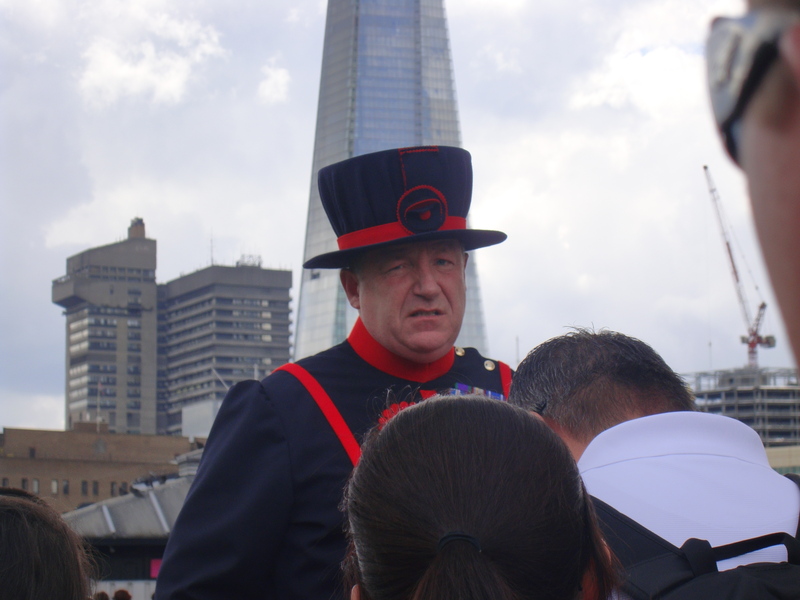 Within the walls of the Tower of London, we joined a guided tour with a Beefeater. 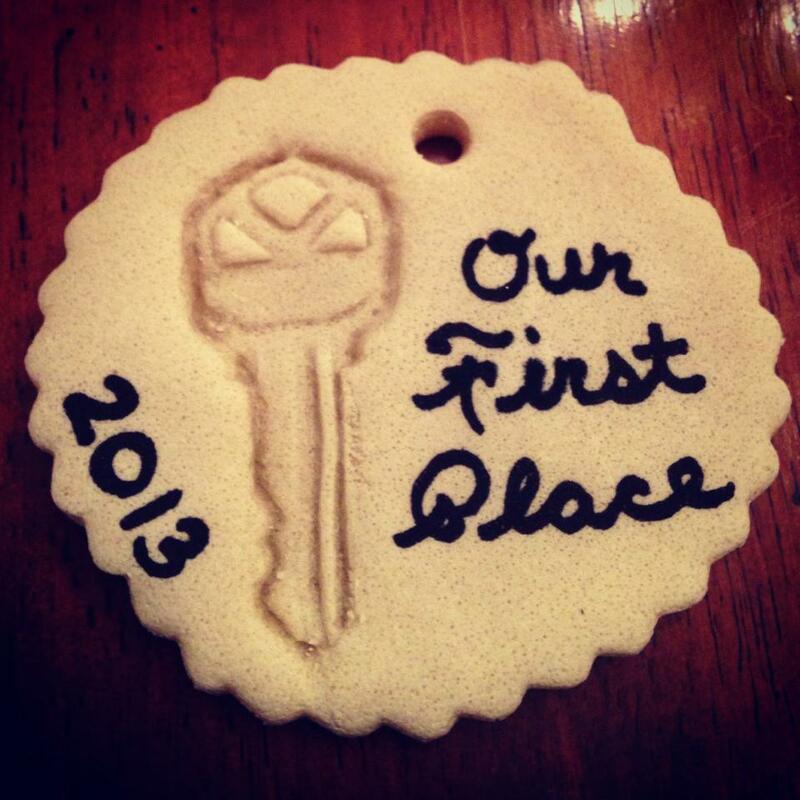 I think we got the best one the Tower has because we learned a ton and laughed the entire way though. He was informative, clever and knew how to keep the audience engaged. A+ Mr. Beefeater. 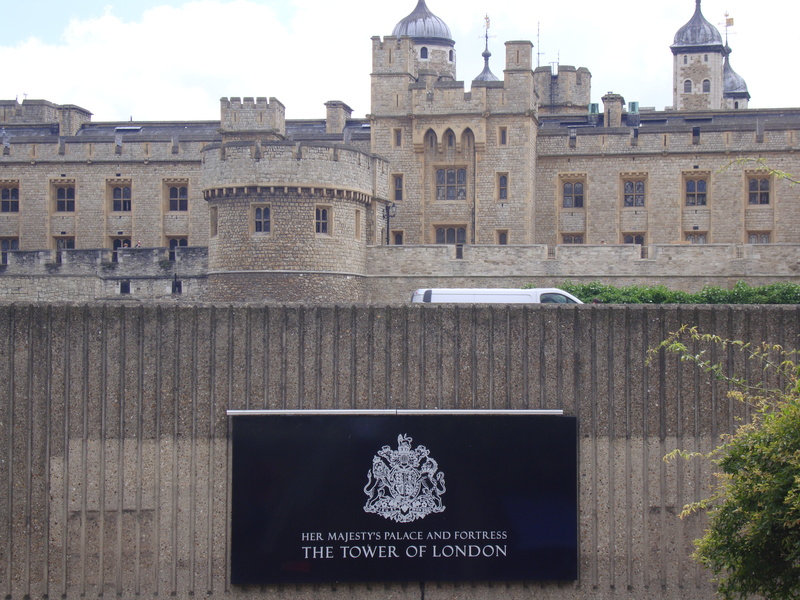 We saw the Crown Jewels, took a tour through the Torture Towers and checked out the Royal Artilleries. The White Tower… home of devices like “The Rack”. 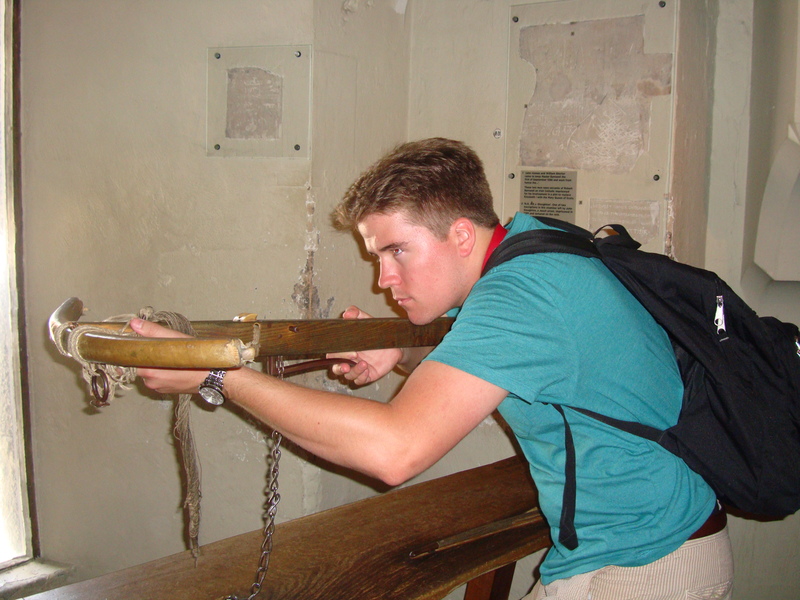 Sometimes Matt likes to play with ancient weapons. Today included things like a gym session with Justin (who made me run a 7:30 mile to the gym and I thought I was going to die), shopping on Oxford Street (oh Primark…), a much-need 2 hour nap, froyo, wine and Despicable Me…. a terrific way to end one of the busiest weeks ever. I want to know… How are things in the States? I heard it’s super hot in Boston! What else should I check out in London and what would YOU like to see in a London-themed giveaway here on the blog? All-in-all, the travel day wasn’t horrible. 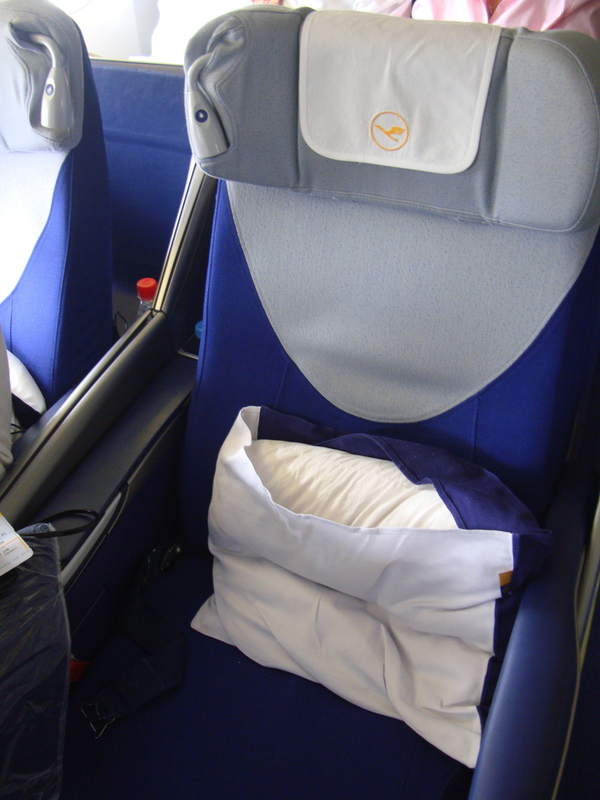 6 hours from Boston to Frankfurt on Lufthansa’s business class is an extremely luxurious (cough cough SPOILED) way to travel. My dad works for Lufthansa so it just makes sense and all…. We landed in Germany at 5:30am their time before boarding a much smaller airplane for the 1 and a half hours to London, where the time changed again, back 1 hour. Hello business class.. thanks for the unlimited drinks for 6 hours. Now, I’ve traveled abroad a lot in my life and jet lag isn’t something that normally hurts me too much, but this time around, it was BRUTAL. I don’t know if it’s because we left the USA so late in the day or if it was the 3 hours getting from Heathrow to my aunt’s house because of a massive line at the UK border or the amount of luggage we had or the time on the tube but either way, I was dying for sleep by noon. Happy to be in England, dying to get some sleep. 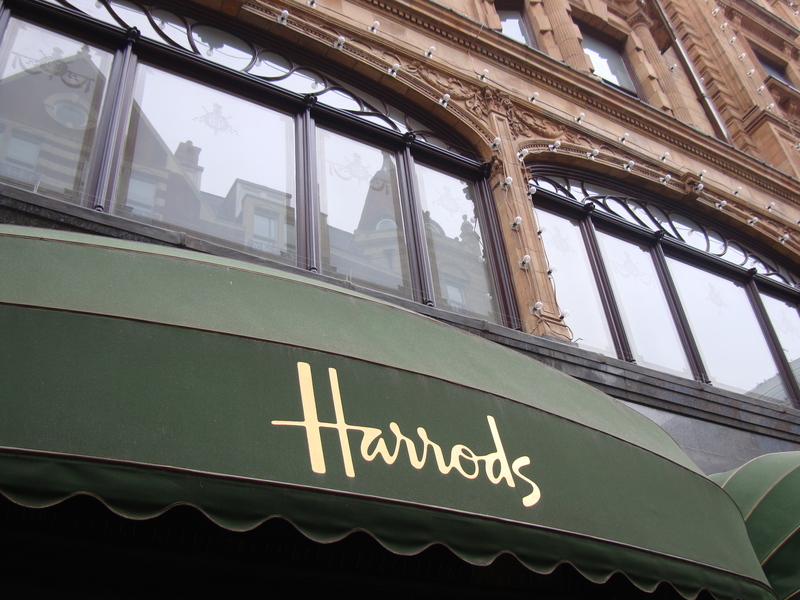 Oh Harrod’s… I could live in you. 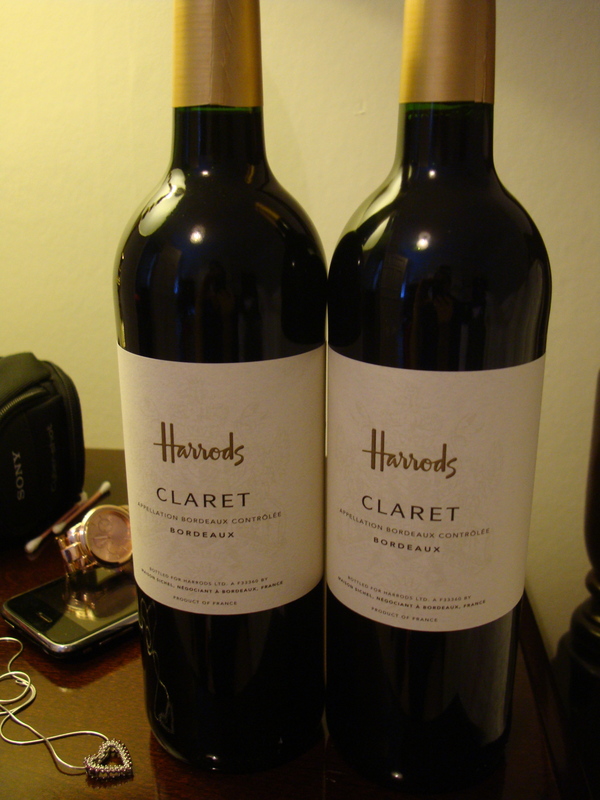 I proceeded to practically run around the store, buying things like Harrod’s brand red wine. Don’t judge me.. this is good stuff. What are the odds these bottles of amazingness make it back to the USA? Answer: Not very good. My family’s place where we stayed for our vacation… freakin’ massive and beautiful. On Thursday, we visited Windsor and saw the castle where the Queen is currently residing. 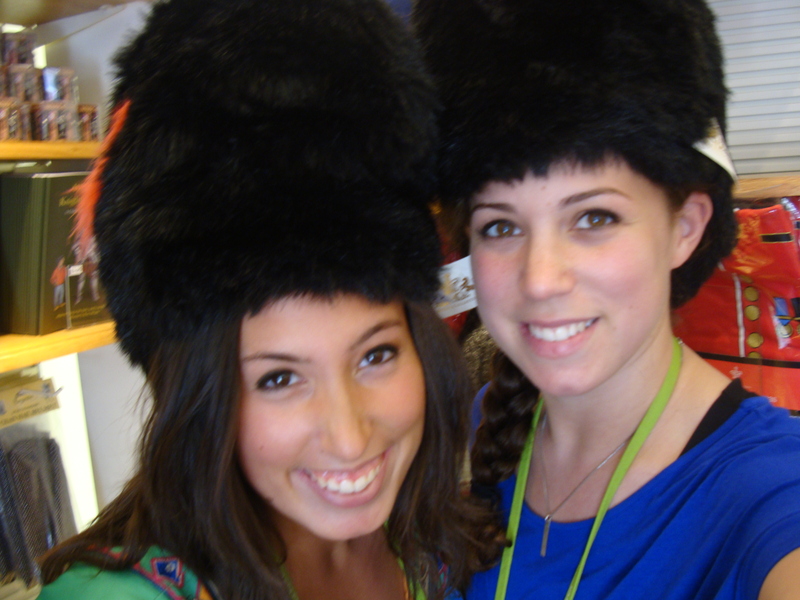 We didn’t actually get to see her, but we did get to see her guards and their stellar hats. 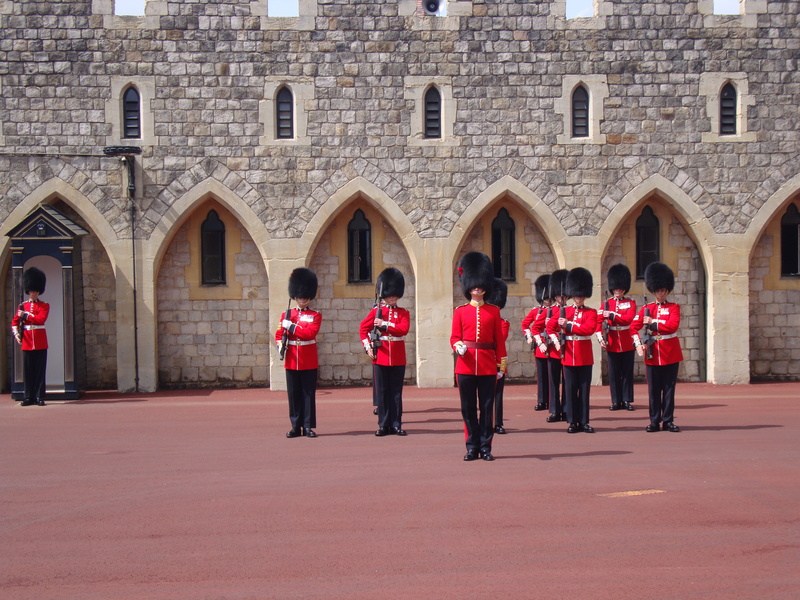 The Changing of the Guard at Windsor Castle. We tried some on just for fun. 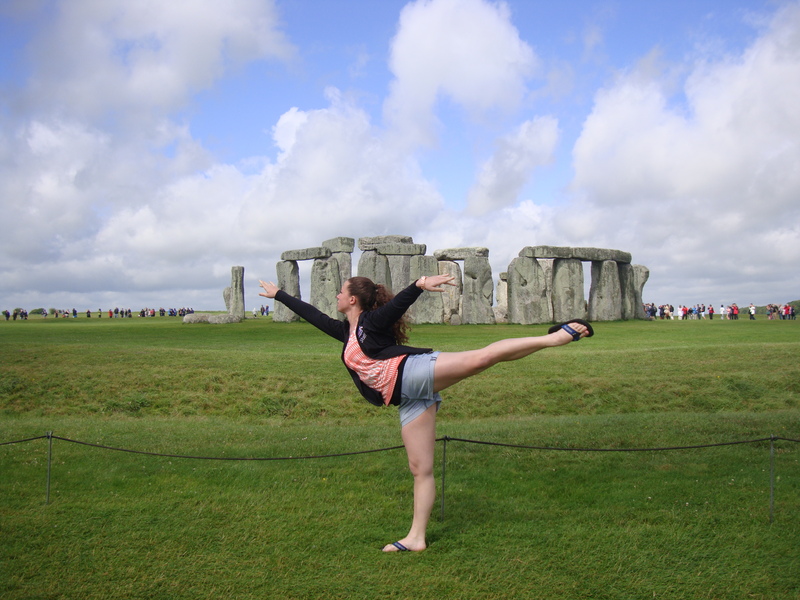 I like taking dance photos in front of historic landmarks… Sorry I’m not sorry. Stonehenge was beautiful, albeit a bit chilly but by the time we got to Bath, the weather changed completely. We toured the Roman Baths and checked out Bath Abbey. 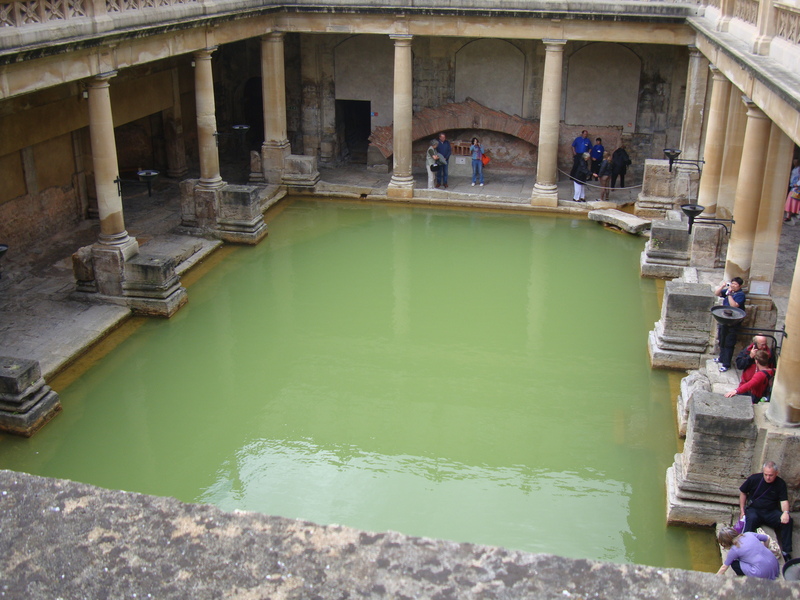 Bath is the setting of one of my favorite books, Wuthering Heights by Emily Bronte, so it was incredible being there where the story takes place. 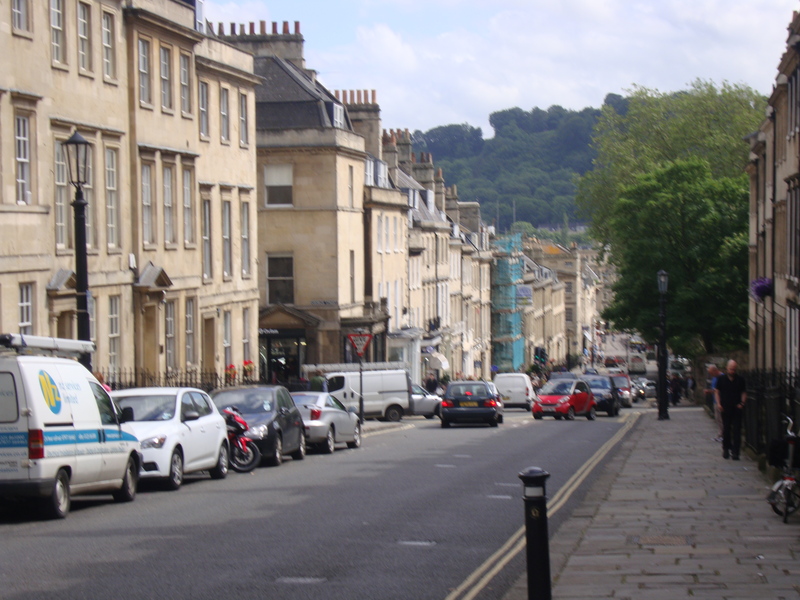 Bath… I could live here. This is Gabrielle.. She’s an expert in what we like to call “photo bombing”…. 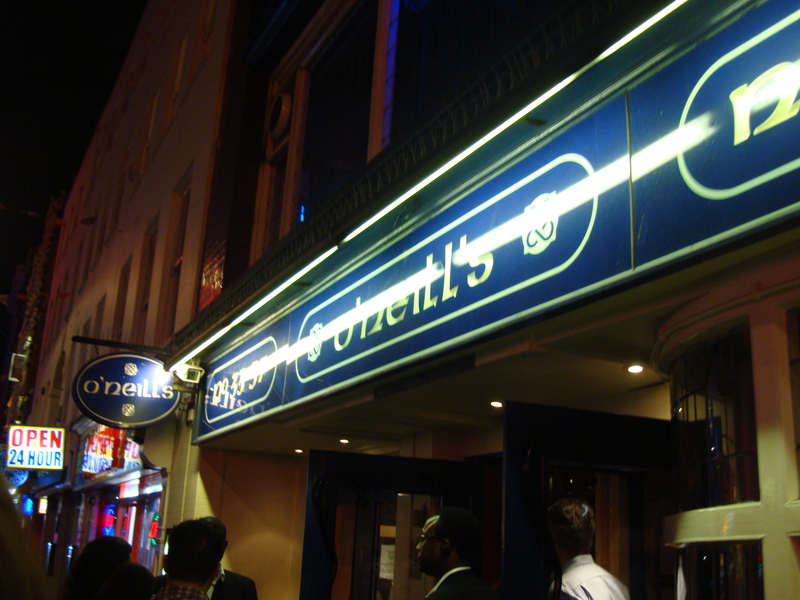 One night club in particular looked slightly familiar..
O’Neills? I thought we left you back in Salem…. Later that night, I decided it would be smart to stay up until 2:45am thinking that I’d get to sleep in the next day. My dad, however, had other plans, strolling into my room at a casual 7:00am to inform me that I needed to get up RIGHT THAT MINUTE because we were going to miss the 8:21 train to Oxford. Fail sleeping in. 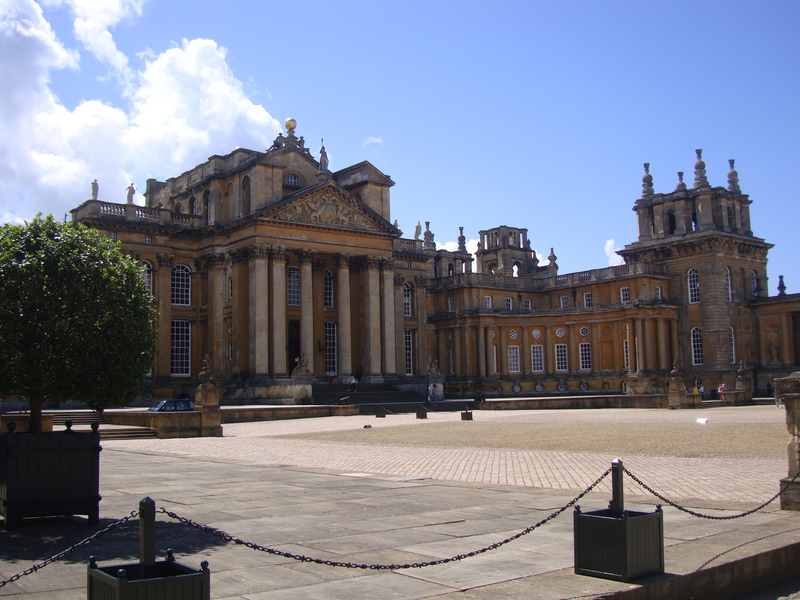 Oxford included a tour of the gorgeous Blenheim Palace and scoping out Oxford University’s campus. Who’s moving in with me? 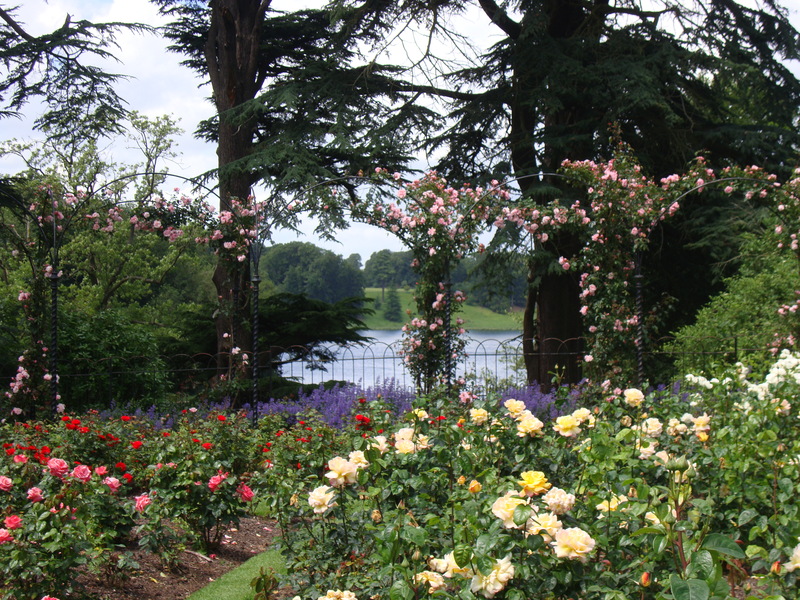 The rose garden of Blenheim was by far my favorite. Reminds me of the Secret Garden. By the way, I got a new camera…can you tell? No more iPhone photos for me! 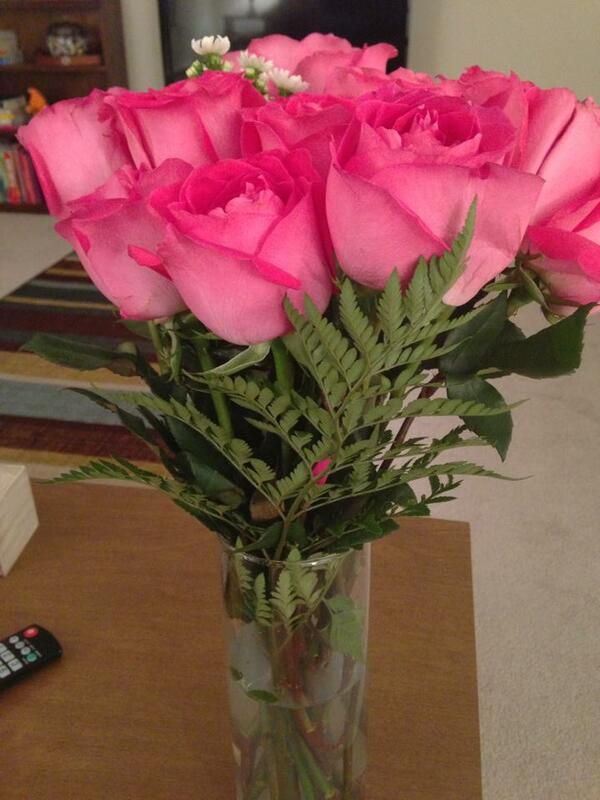 Did I mention how much I love roses? 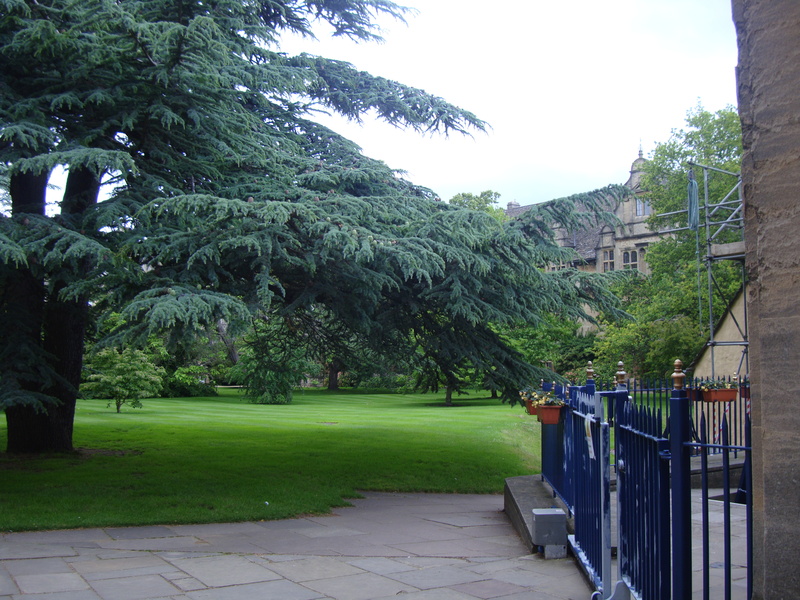 100 British pounds to whoever can name what movie this courtyard was featured in…. Hint: It’s one of my favorites series of all time. 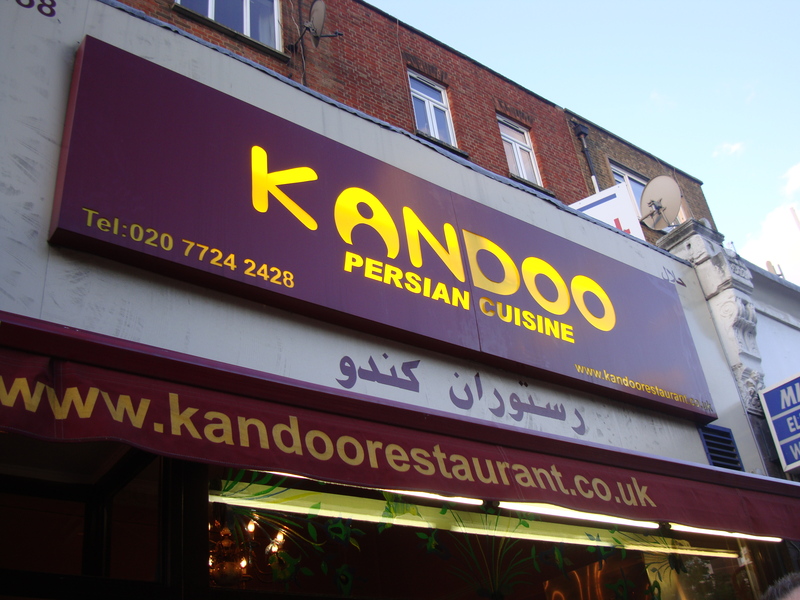 Oxford was the shooting location for……………..
After falling asleep on the train ride home, my family went to dinner at one of my favorite spots in London: Kandoo. This hole-in-the-wall Persian place is BYOB and serves incredible food. Even my mom, the pickiest eater in the entire world, loved it. Today I finally got to sleep in and didn’t wake up until… noon. With my parents out of the house (they decided to go back to Bath and spend a few more hours there), Melissa and I printed a map, got some tips from our cousin Ali and hit the streets of London for our own pub crawl. 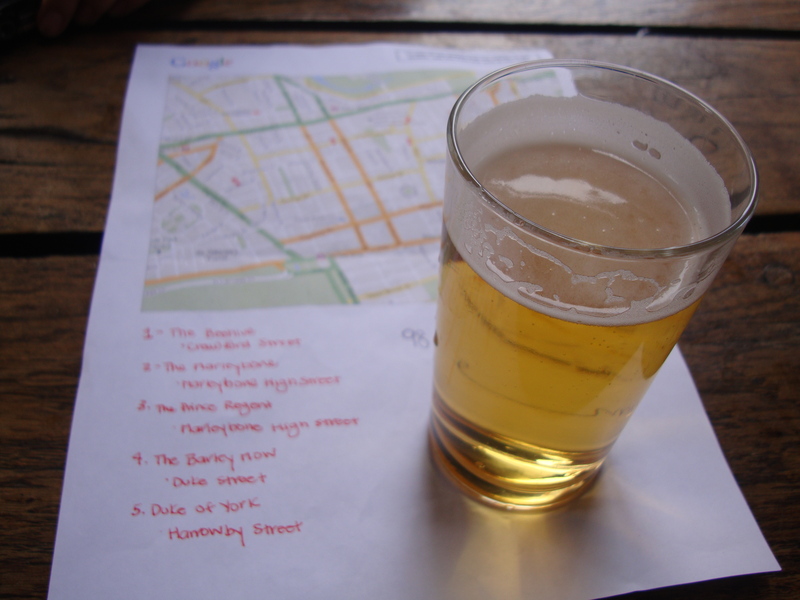 I have a map and a beer. Go. 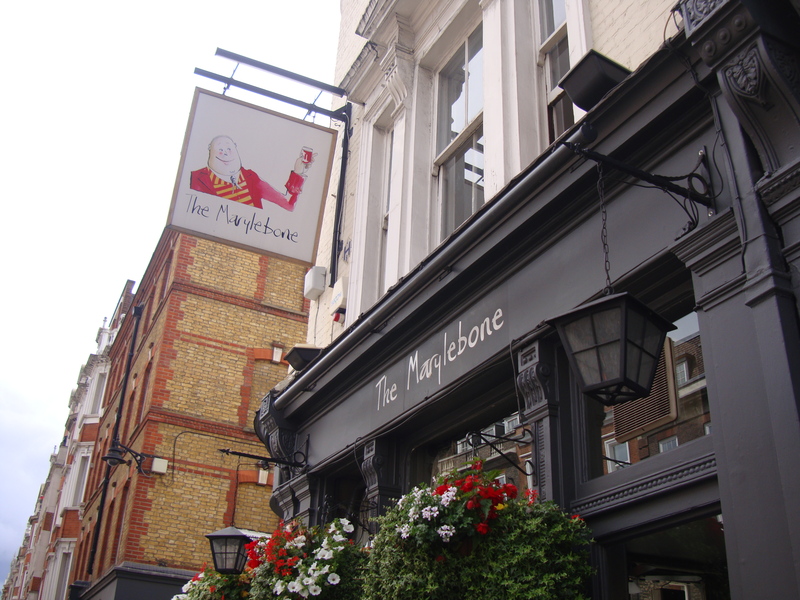 Then, The Marylebone, which ended up being my favorite stop of the day. I recommend the Passionfruit Bellini. 2 for 1 cocktails all day Sundays…. I will be back. 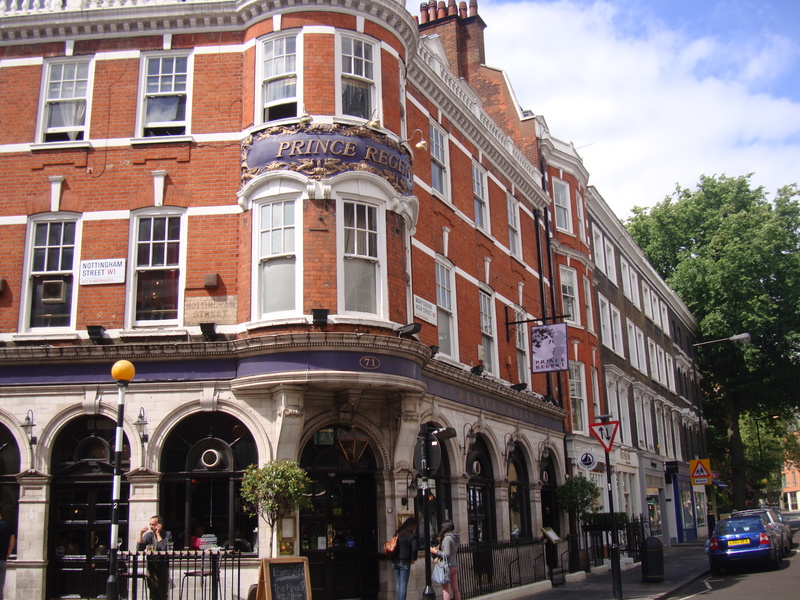 Third, The Prince Regent, where I had my first-ever glass of Zinfandel. I usually stay away from this type of red because I’m biased towards Merlot, Cab and Malbec, but this one was surprisingly delicious. 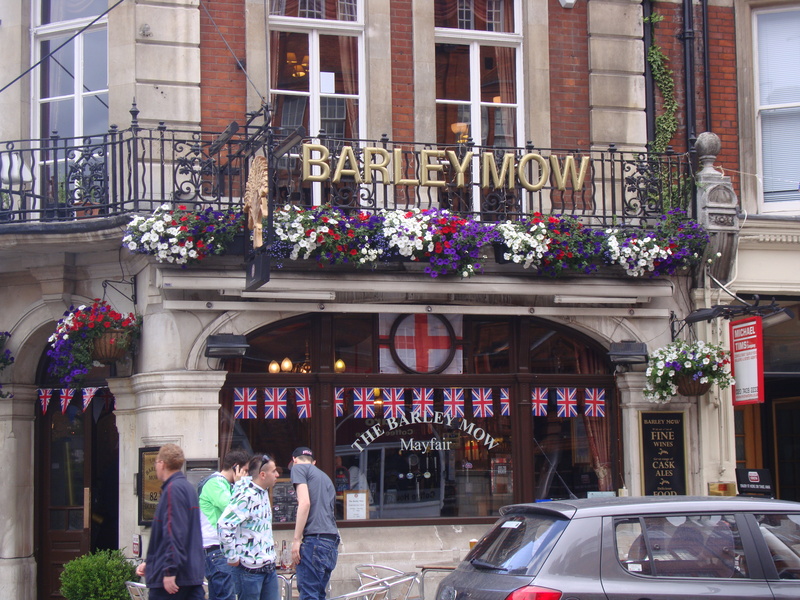 Our last stop, the Barley Mow, was cute too. 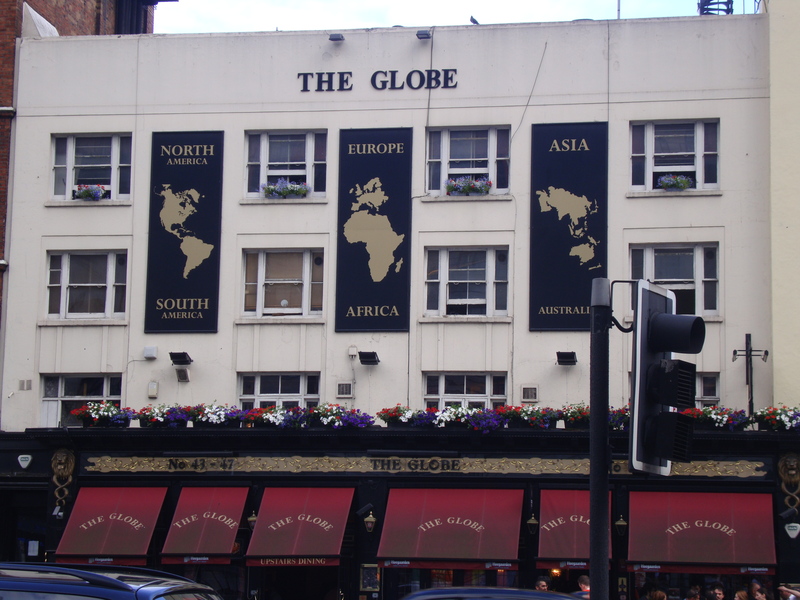 About three seconds after we left the Barley Mow, we got a call from Ali who told us to come to a bar called The Globe to watch the Italy-Spain “football” game with her, Gabby and bunch of their Embassy friends. Fun place but super crowded for the game. 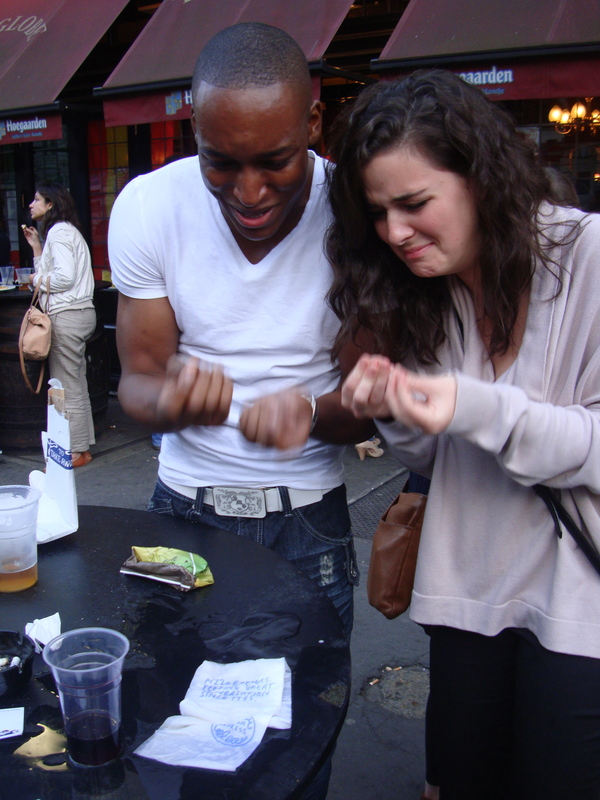 …And then Ali spilled her full beer all over the place and our new friend Derek laughed at her. 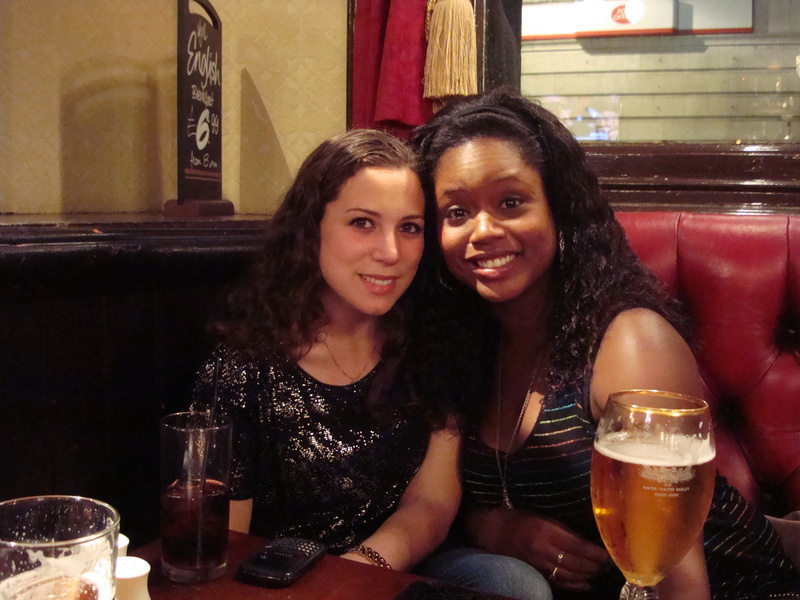 All-in-all, a successful pub crawl around London and a great way to end my first week here. 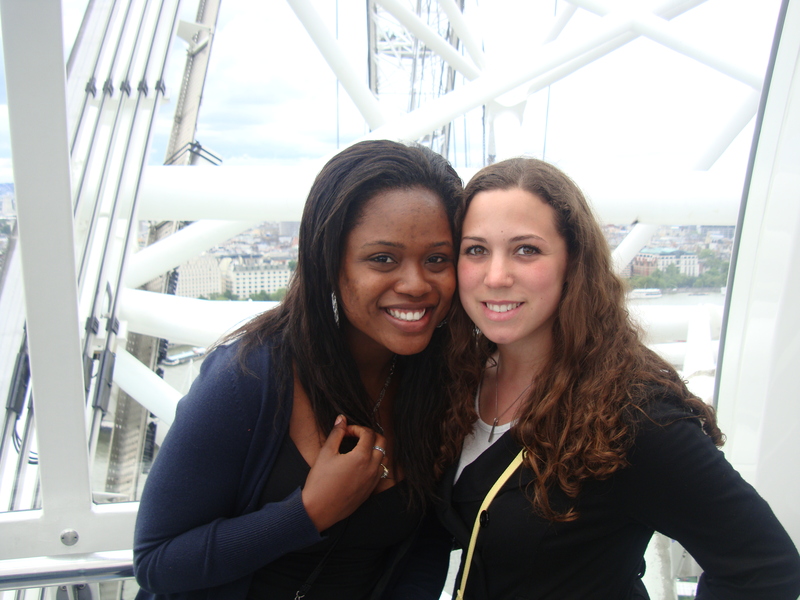 I want to know… Have you traveled or studied abroad? 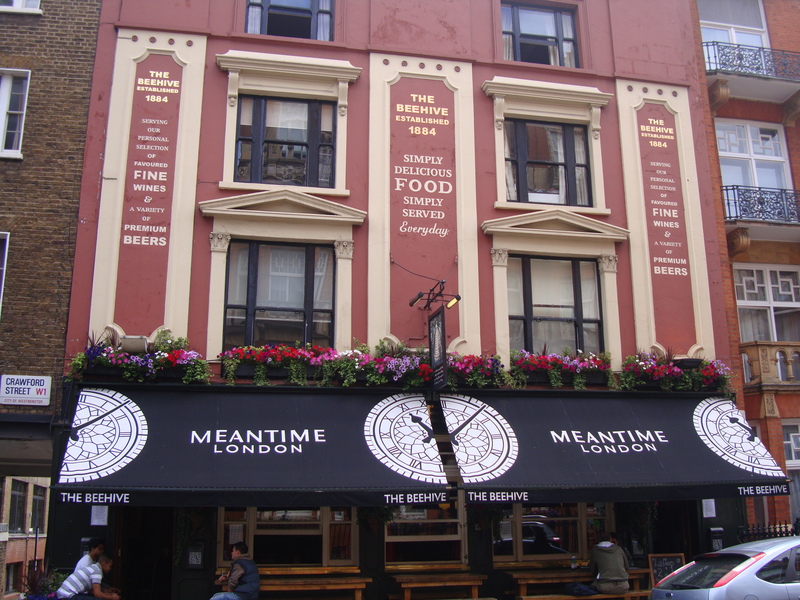 What’s your best advice for getting around London and/or Europe? I’m dying to get to Paris and Rome but I’m not sure of the best way to go about it… help!! In 8 days, I will be on a plane headed for one of my favorite places in the entire world: London, England. But before we talk about why, let’s back up to a little over a year ago. When I was looking at graduate schools, BU was at the top of my (very short) list. After bombing my GREs and writing what I thought were less-than-stellar essays, I sent my applications away and hoped for the best. The day my acceptance letter from BU came, I screamed so loud I almost sent my then-pregnant friend Miriah into early labor… I was just that excited. 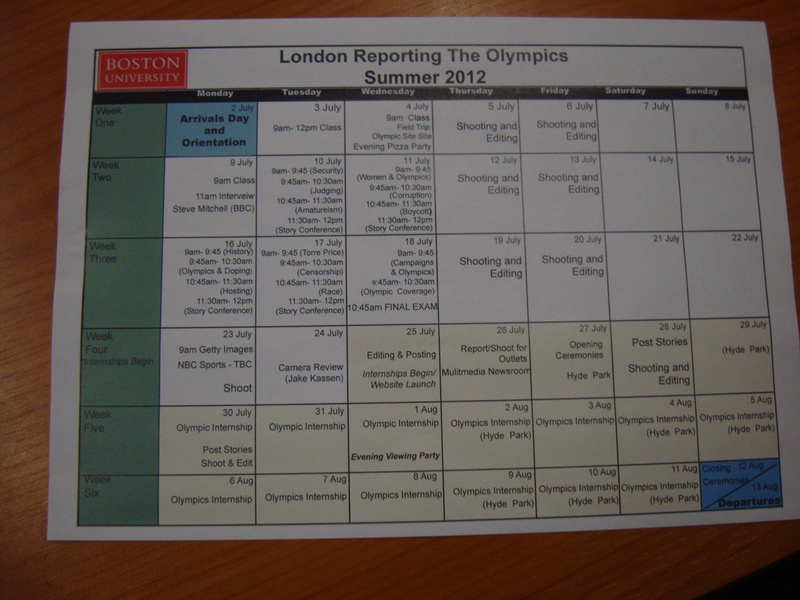 When I went to BU’s accepted student’s day, one of the professors told us about an opportunity to study abroad in London covering the 2012 Summer Olympics. After already falling in love with the school, the possibility of spending a summer in one of my favorite cities sealed the deal. In October, I applied for the program, found out I got in and happily sent in my $500 deposit without a second thought. Do we look happy? Of course we do.. we’re going to the Olympics! 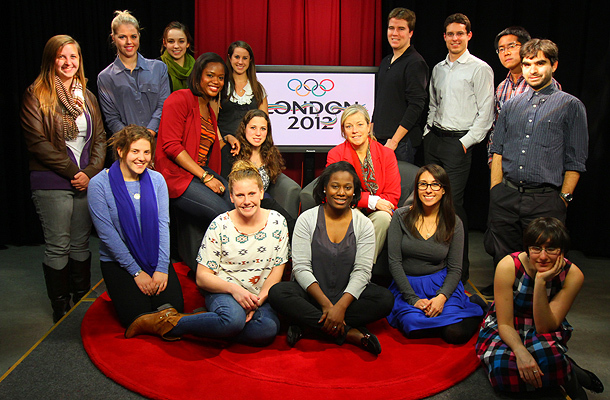 The program, appropriately titled “Covering the London Olympics”, consists of 6 weeks in England – 3 weeks dedicated to a special topics class Monday through Wednesday and then 3 weeks of full-time internships with a local media outlet. I was assigned boston.com and could not be happier. 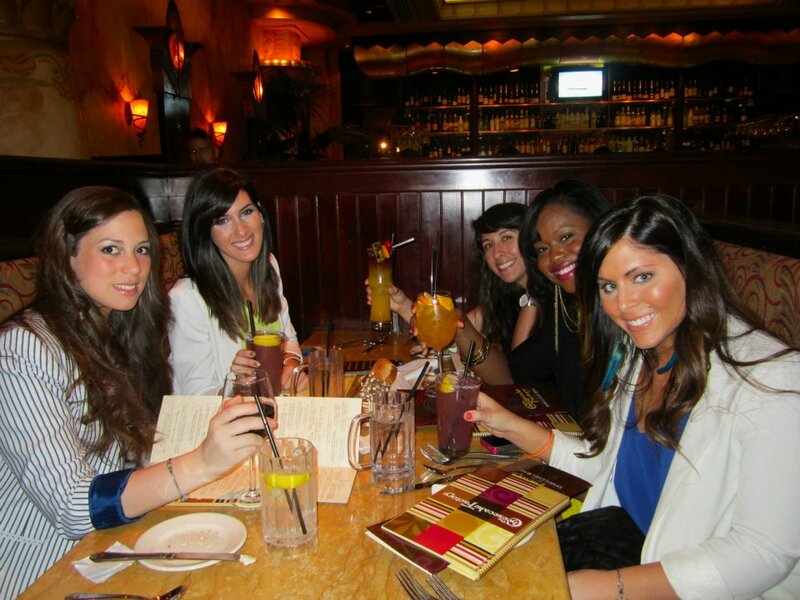 With a group of 3 other girls, we will be producing our own website linked to boston.com and I will provide news packages and video content from on-site in London. Not too bad right? – London is one of my favorite cities in the world. I’ve been twice and if I could live in any other country, England soars to the top of the list. Italy is a close second. – I’m spending the first week there with my family. My dad’s itinerary already includes places like Bath, Stonehenge, Windsor and Oxford. My sister wants to do a pub crawl with my parents. It’s going to be an interesting week. – Harrod’s. The most amazing department store in the world. I don’t even know if calling it a “department store” is really a fair way to describe it since it takes up an entire city block, including a basement level, and takes an entire day to get through. The wine cellar alone makes me want to move in. – I plan on traveling to other places while in Europe. The top two locations? Paris and Rome. I’ve been to Paris but the last time I was there, I was 9. I have this not-so-secret ambition to shoot a stand up in the grassy area in front of the Eiffel Tower. I’ve never been to Italy but it’s where my family is from. I plan on tossing a coin into the Trevi Fountain and wishing for the one thing I want more than anything else in this world. Sorry… can’t tell! – This will be the longest I’ve ever been away from home for an extended period of time. Don’t get me wrong – I’m a big girl and I can take care of myself but I have a feeling that a bout or two of homesickness will hit me at some point. I’ve always been very much attached to my family and friends so leaving for 7ish weeks will be tough. – My personal life is still a little on the messy side. It’s not exactly ideal to peace out of the country while I feel this way but maybe the time away really will help…? Let’s just leave it at that. – $$. London is expensive, I want to travel and my funds are tight. I guess I can sacrifice eating for souvenirs. Hope my aunt doesn’t mind me bringing my laundry to her place… to do one load there costs almost 30 bucks. I kid you not. I think that’ll do for now. So while I’m in London, my iPhone will be disabled other than it’s camera function (SAD!!!!) I will have internet and be updating the blog, hopefully more regularly than I have been lately. I promise to take a million pictures and post them while I’m away as well as tweets and links to my work. I love e-mails and Tweets and Facebook posts so don’t hesistate to send me any! 2011. I feel like it went by so fast. At this time last year, I was a completely different person and I’m happy to report that I’m a better me than I was at the close of 2010. This year, I achieved things I never thought I ever could. I choreographed three group routines, I started running and ran four 5K races, I got into grad school and survived my first semester, I realized what I truly want in my life and I am starting to become the person I have always wanted to be. I worked my third summer with the National Dance Alliance, I now dance in an amazing company in Boston and BU has opened my eyes to incredible new opportunities, including an acceptance into a 6-week study abroad program to cover the London Olympics next summer. 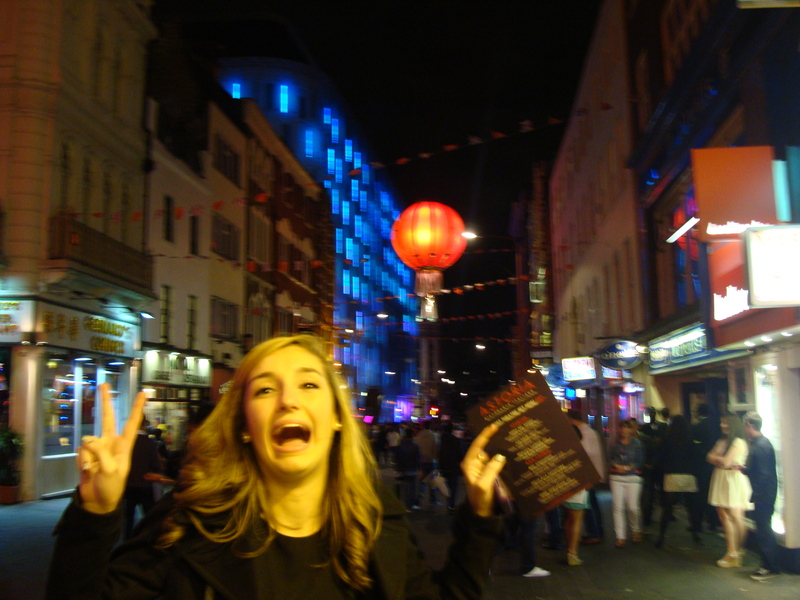 2011 taught me to not take life too seriously. To enjoy each day, love whole-heartedly and appreciate myself for who I am. It’s a great feeling to look back on this year and know that I have grown in so many ways. Back in July, I set some mid-year goals for myself. So let’s recap them and see how I did. 1. Work (at least) 8 NDA summer camps. Done. I worked 9! I traveled everywhere from Kansas to Maryland and loved every minute of it. 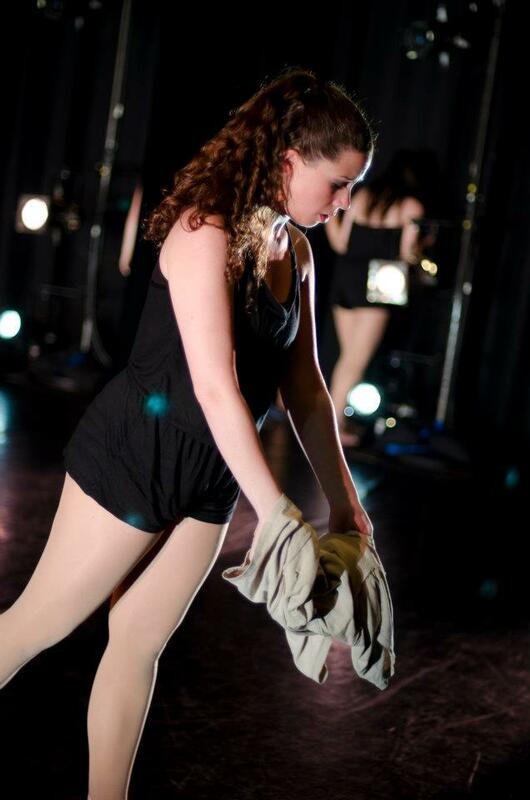 NDA friends take awesome photos. 2. Run 2 more 5Ks. Done. 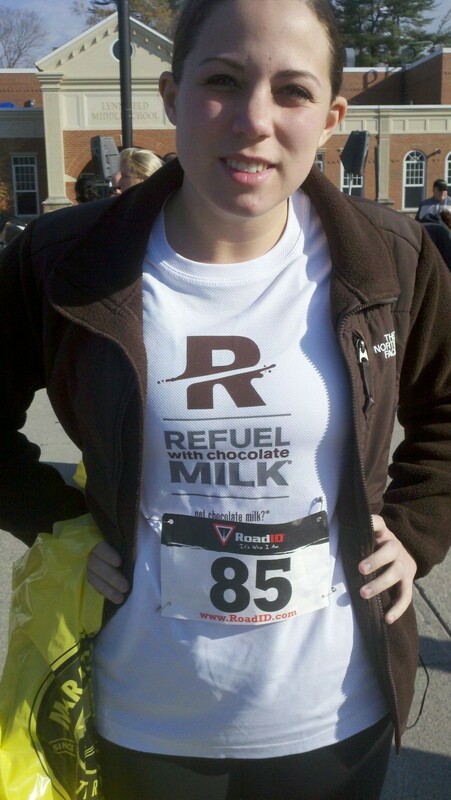 I ran 3 more: Run for Ryan’s Cup 5K in September, Witch City 5K in October and the Lynnfield Turkey Trot 5K in November. I wanted to run one in December as well but since I didn’t get to, I signed up for the “Run Your Hangover Off 5K” on January 1st. I think it’s the best way to kick off 2012! 3. Host a blog giveaway. Done. I hosted my first giveaway in September for Chocolate and Wine’s 1st Blogiversary! 4. Stick to Weight Watchers (not playing a numbers game here. Work out, eat right, follow the points, be healthy and let the body do what it will.) Kinda done. I don’t exactly stick to the WW plan but I did manage to drop 12 pounds this year and I am VERY happy about that. I, I, I, I WORK OUT. 5. Rock the first semester of my grad program at Boston University (all A’s would be sweet but we like B+s too.) Kinda done. 1 A-, 1 B+ and 2 Bs. I am very proud; grad school is hard, man. 6. Try 1 new recipe a week. Fail. Sometimes when I cook, I use the same recipes over and over. 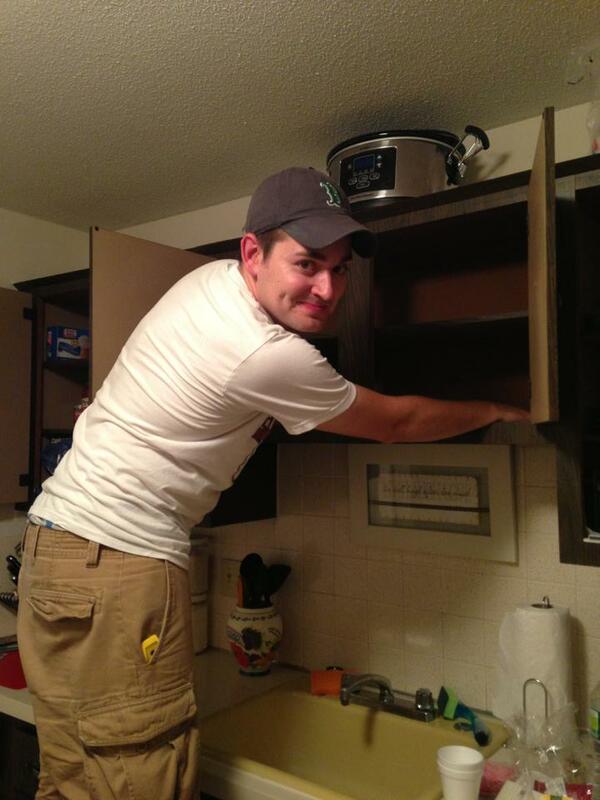 But now that I have a beautiful new crockpot, I might be able to achieve this goal in 2012. 7. Dance in 4 DanceWorks Boston fall pieces. Done. I danced in 5! 6 if you include the finale/Flash Mob! 8. 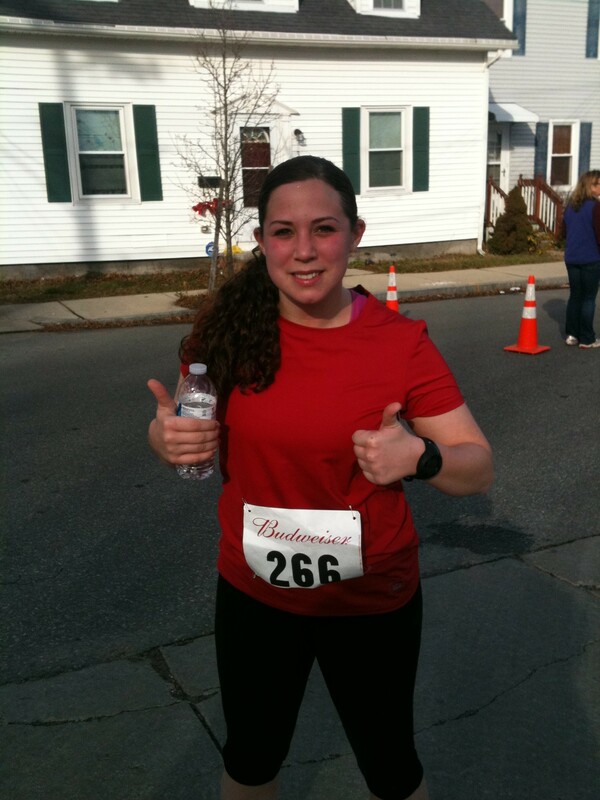 Train for and run a 10K. Fail. I chickened out. 2012 will hold at least one 10K and maybe even a half marathon. 9. Take hot yoga regularly. Fail. I probably did it a total of 3 times between the summer and now. Overall, I think this has been a great year. I achieved most of my goals and really let myself let go of the rest of the emotional baggage leftover from undergrad. So long, 2011…On to 2012! Goals and “resolutions” to come! I wanted to give a recap of my trip (with lots of photos) without boring you all to tears so I’ll keep it as brief as I can and let you revel in my photography skills.. or lack there of. 2 Saturdays ago, the 13th, Stephen and I boarded a bus at 7:30 am to make the 4 and 1/2 hour trek to NYC. 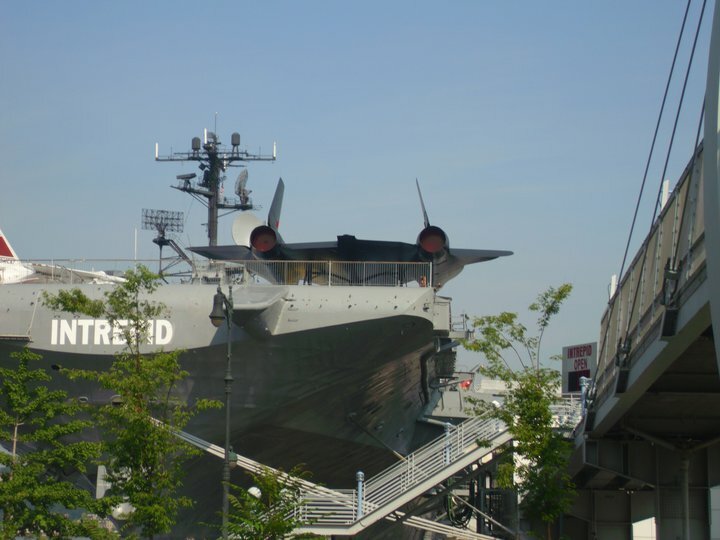 When we got there, we walked 12 or so blocks to the Norwegian port (stopping to look at the Intrepid military boat per Stephen), dropped our checked bags off and headed to the security line. Our stateroom, though a bit small, was beautiful with a large window and an obstructed view of the ocean. It was raining in New York that day or else my bathing suit would have been the first thing out of my suitcase Instead, knowing there was a massive crowd still boarding, we relaxed in the room until we heard the cruise director, Dan The Man, announce that we would have a “security drill” and it was mandatory. Fun times, people, fun times. After the drill, we got strong fruity drinks and watched the boat disembark New York City. 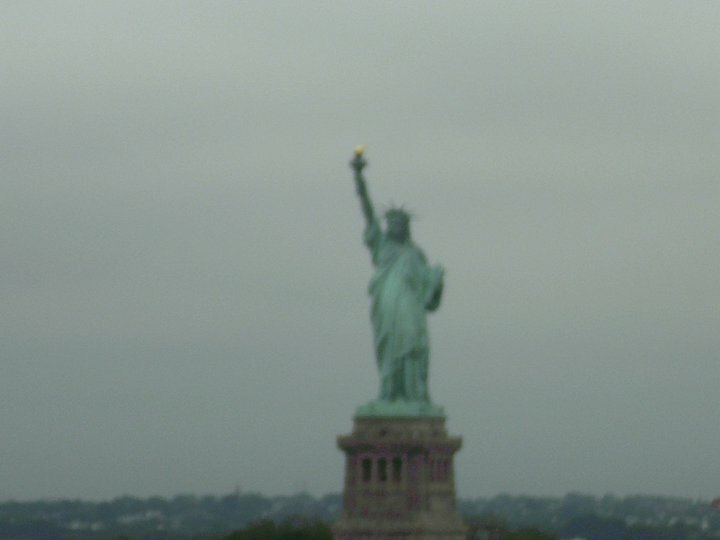 We saw the Statue of Liberty too and even though I’ve seen her before, Stephen was pretty excited to witness it for the first time. After dinner, we went into the Stardust Theater to watch the “Welcome Aboard” show. It gave us a sense of what types of entertainment would be provided during the week and I was more eager than ever to get started. Setting the alarm for an early morning workout, we headed to bed around 11, exhausted from our travel day. We spent Sunday in the sun, cruising down the coast. After a sweat session in the gym, I was determined to get a tan. The weather was warm and sunny. New bathing suit on, tanning lotion ready and book in hand (Harry Potter 7… had to reread it before the last movie…), I relaxed outside like a cat curled up in the warm sun. Nothing could deter me from a peaceful few hours outside. Many chapters and a slightly deeper skin tone later, I pulled Stephen from the outside deck to some indoor activities. First, we went to an art auction where we saw original pieces from some of the most famous artists in history. Oh, and there was a Picasso that went for $78,000. NBD. The auctioneer even gave away $99 spa treatments and you knew I would be all over that. I got a hot stone back massage, foot massage and mini facial later on that afternoon and was in spa heaven. It’s nice to be pampered on vacation. I also dragged Stephen kicking and screaming convinced Stephen to go to the Fyzz Lounge to take a Merengue dance class with me. 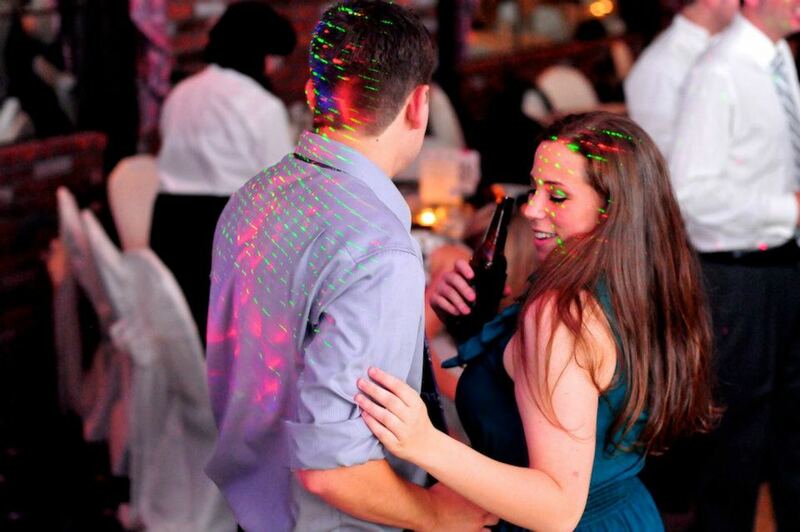 Yes friends, I got my boyfriend to move his hips and sway to the music. It wasn’t necessarily a performance worthy of Dancing With the Stars but he tried it to make me happy. Monday morning, we were up early again to hit the gym before the ship docked in Port Canaveral in Orlando, Florida and venturing to Universal Islands of Adventure. 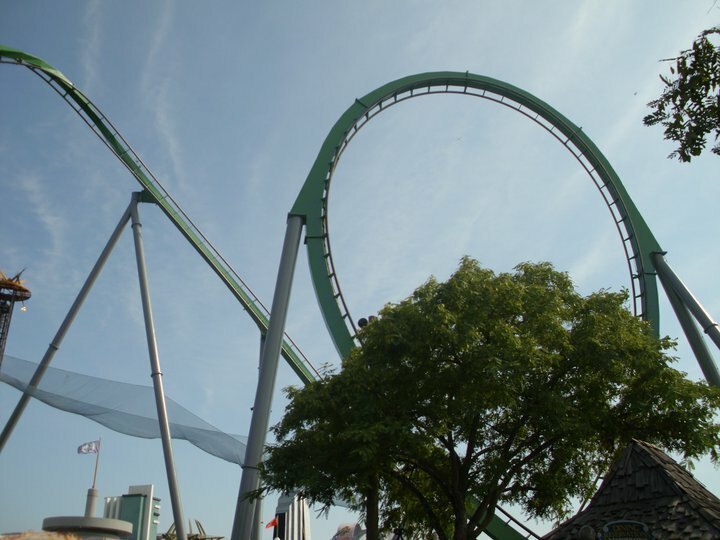 I had been to Universal Studios on many occasions in the past but could never convince my parents to take it a step further into the park with the giant rollercoasters (my parents aren’t as fun as me.) I was most excited about one section in particular. Can you guess what? 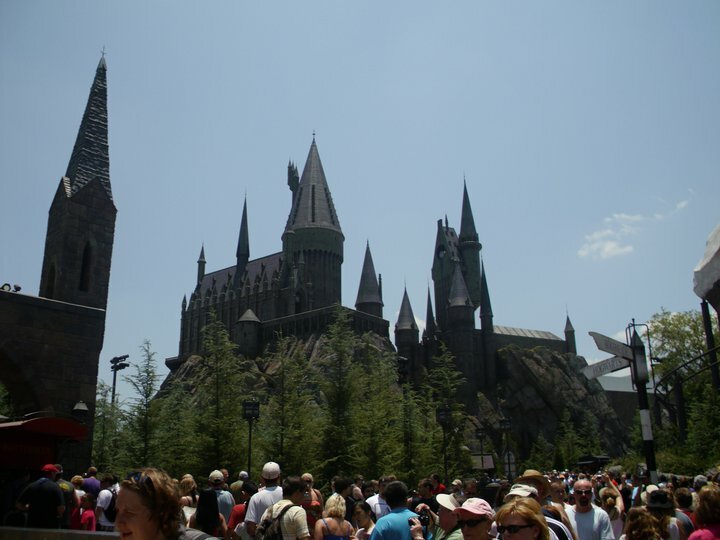 When we entered the park, I practically ran to the entrance of The Wizarding World of Harry Potter and was immediately overwhelmed. Sweating slightly, we went right to the main attraction: Hogwarts Castle for the ride, Harry Potter’s Forbidden Journey. Sure, it was approximately 100 degrees out and the line was an hour long but I was determined to do it first. The line wound outside for a while (in the greenhouses) before entering the castle. 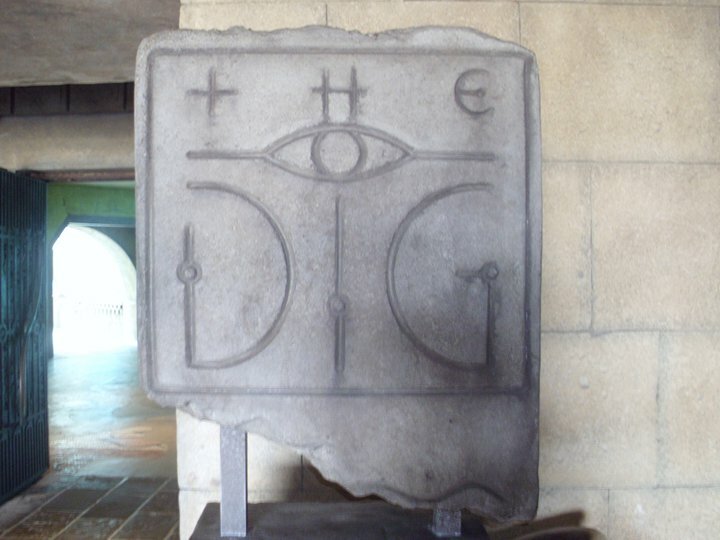 Inside, you walk down the corridor to Dumbledore’s office where the golden eagle statue waits for the password. Winding still, you enter Dumbledore’s office where the pensieve, destroyed horcruxes and Dumbledore himself can be found speaking with those in line. Further still, Harry, Hermione and Ron talk about the adventure you are about to take before with them. You step onto the ride platform, get strapped into your “broom” and take off for the most exciting 2 minutes I’ve ever had on a ride. I may have screamed when we came face to face with a fire-breathing dragon and we got a little too close for comfort to the spider, Aragog, but I loved the ride and could’ve ridden it again and again all day long. 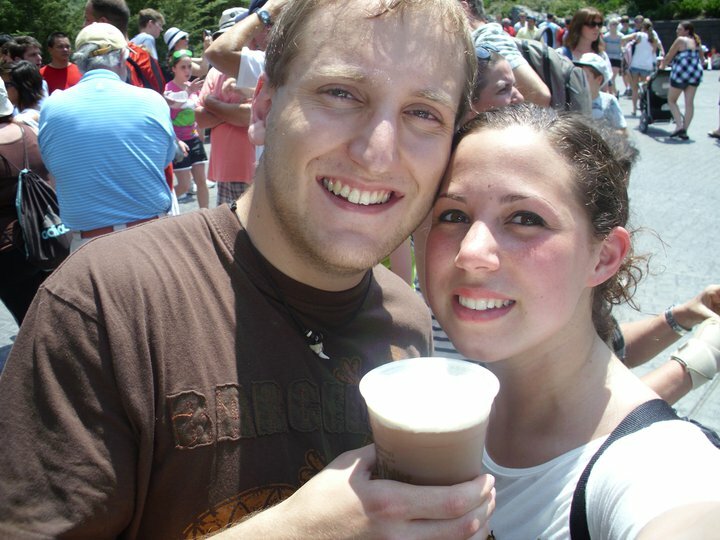 Following the ride, Stephen and I indulged in a little butterbeer and a little wand buying. 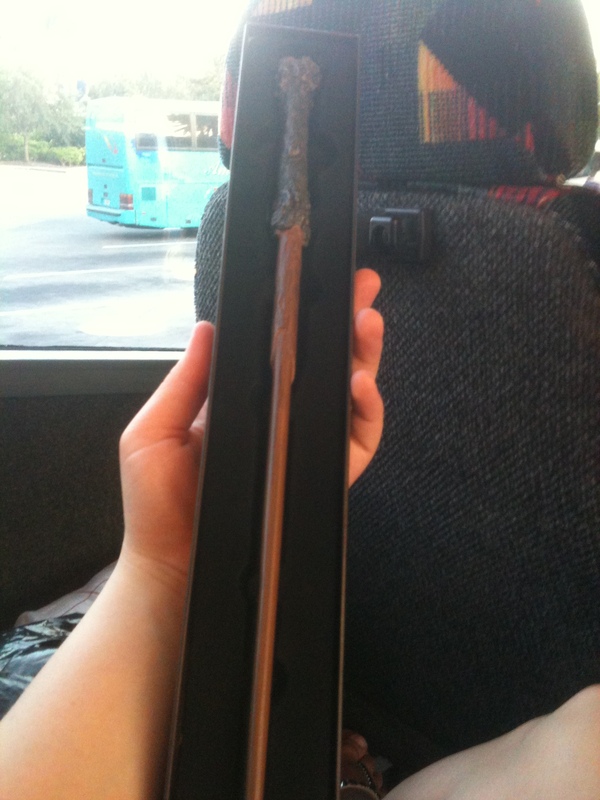 Yes, I bought a wand. 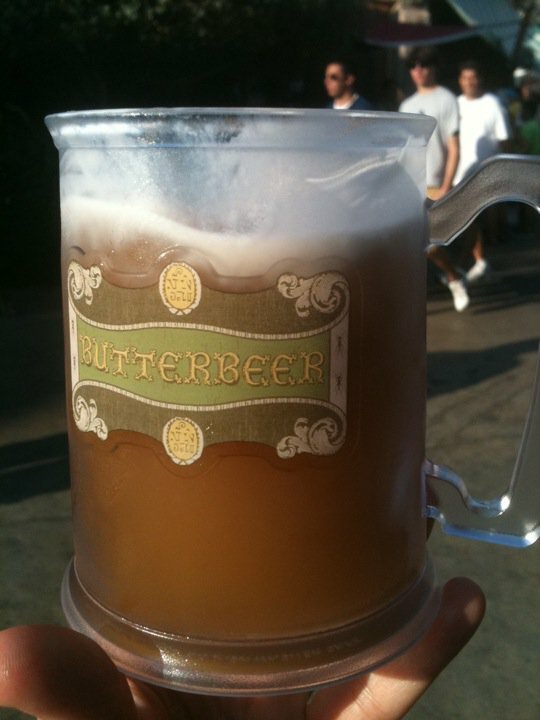 And yes, butterbeer is frothy, sweet and the “foam” they put on top was the finishing touch. I even got a cute souvenir mug to take home. I don’t hate it. We continued through the park, getting drenched on the Jurassic Park River Cruise. If you go to this park and they tell you it’s like the Jungle Cruise at Disney World, they are lying. It’s more like Splash Moutain with dinosaurs and more water. Fun stuff. And we only waited 10 minutes in line for the Hulk ride which is practically unheard of in a crazy-busy theme park like Universal. It was awesome. After about 7 hours of sweaty fun, we headed back to the ship. 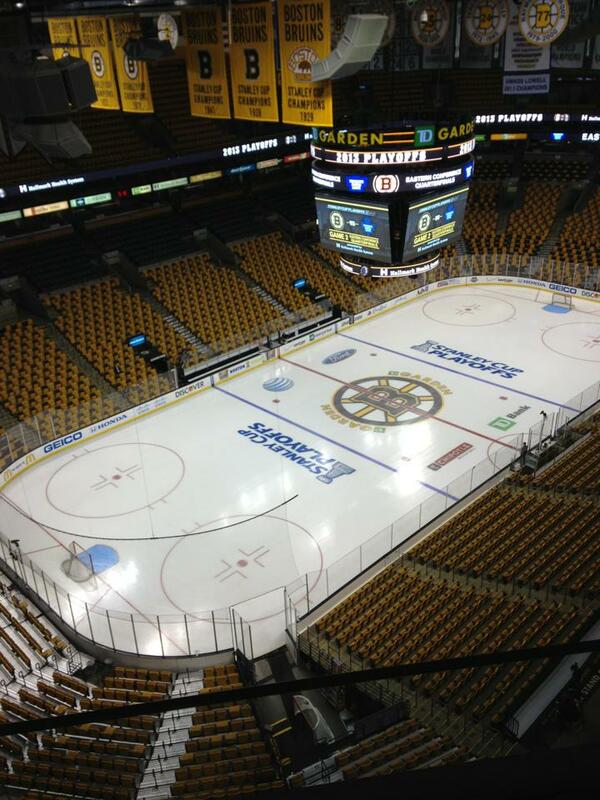 I was exhausted, hungry and eager to watch Game 6 of the Stanley Cup Finals between the Bruins and the Canucks. I ran walked briskly to the Fyzz Lounge where the game was being broadcast on a flat screen TV. 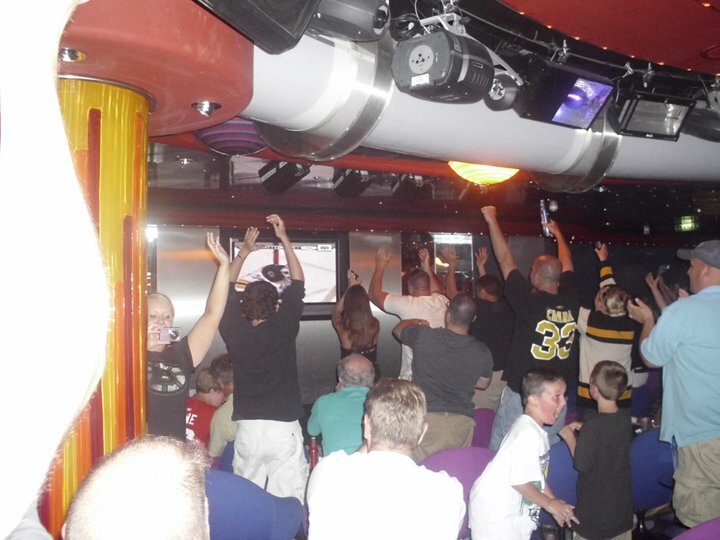 Lots of Bruins fans and even some Canuck fans took over the lounge. In the end, if you didn’t watch the Stanley Cup Finals, the B’s won game 6 to force the series into game 7. Stephen and I even met a nice couple from Pennsylvania who were Bruins supporters. It’s nice to see temporary converts when their team doesn’t make the finals. Tuesday and Wednesday were dedicated to the Bahamas themselves. 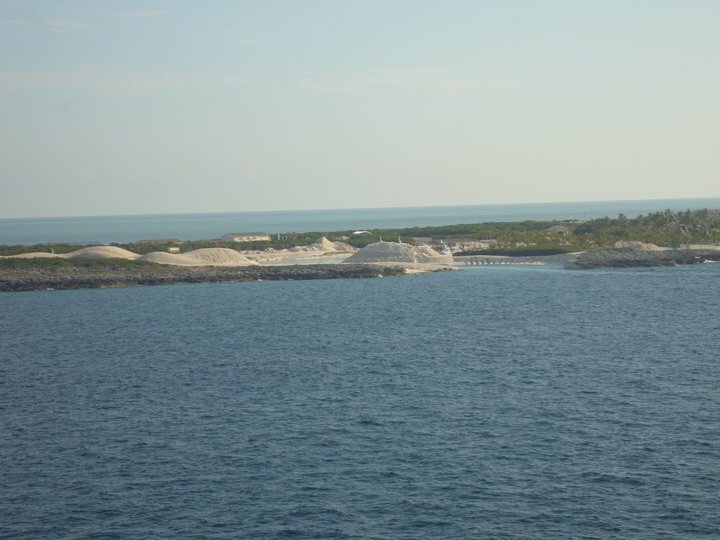 Tuesday, the ship pulled up to a gorgeous island, Great Stirrup Cay, where Stephen and I spent the day snorkeling, enjoying the white sandy beach and crystal clear water. Okay, okay, I snorkeled all of 30 minutes before getting freaked out and opting to stay in the shallow part of the water and getting my tan on most of the day. 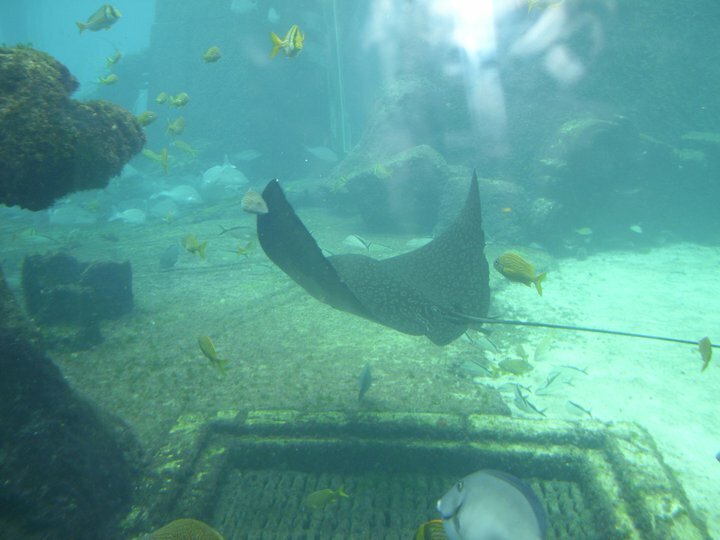 At least I tried the snorkeling part. There were mere wisps of clouds that day and the sun was beating down hard. Despite my efforts with applying and reapplying sunscreen, I found myself with a terrible burn later on. Fail. On Wednesday, I was an attractive shade of boiled lobster. 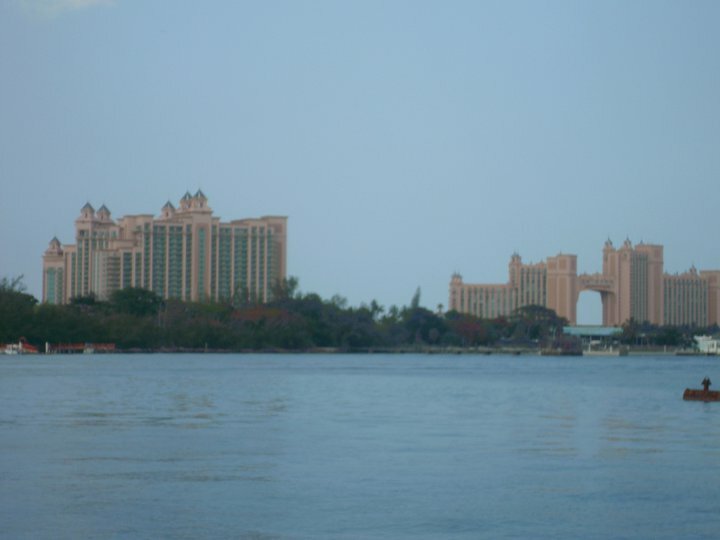 Our ship docked in Nassau, Bahamas and in the distance, we could see the Atlantis Resort, one of the most expensive and glamourous resorts in the entire Caribbean. I immediately thought of the Mary-Kate and Ashley Olsen movie “Island in the Sun”. Don’t judge. It was another hot day, lots of sun and minimal cloud cover. Additional burning may have occurred. We spent lots of time on the river rapids getting tossed around in inflated tubes and I even swam in the large pools. I know, right… me, swimming? I must’ve been wrapped up in the moment or something. 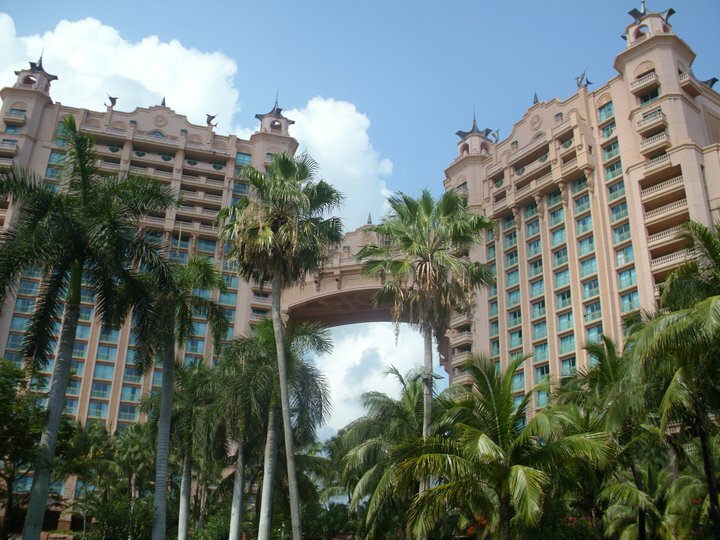 Stephen and I also attempted those large water slides the Atlantis water park is so famous for but in the blazing heat and unshaded long lines, we had to abandon our vertical drop adventures for a colder attraction. Plus, I saw how steep and high the “Leap of Faith” slide was and totally chickened out. No faith. 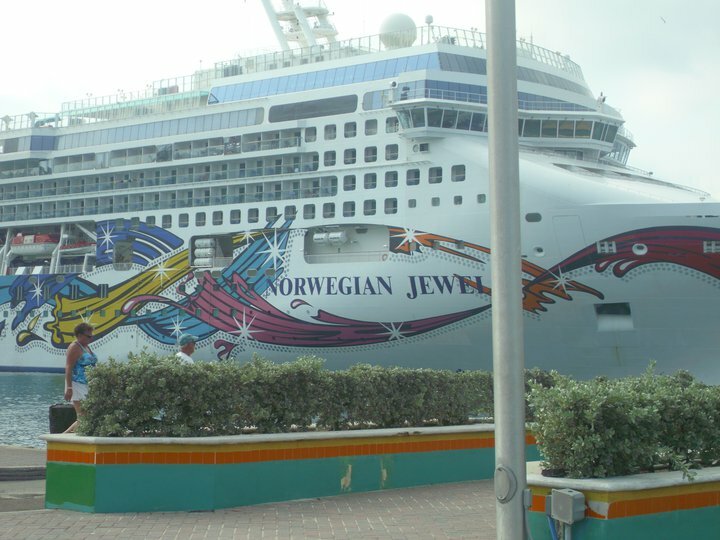 I was exhausted by the time we got back on the Jewel but there was no time for sleeping. Game 7 of the Stanley Cup Finals was on and the Fyzz Lounge was packed. On that happy note, I had a glass of red wine and went to bed, excited to sleep in the next morning. Thursday included such things as: a workout, lots of aloe-vera, reading, minimal sun and maximum entertainment. 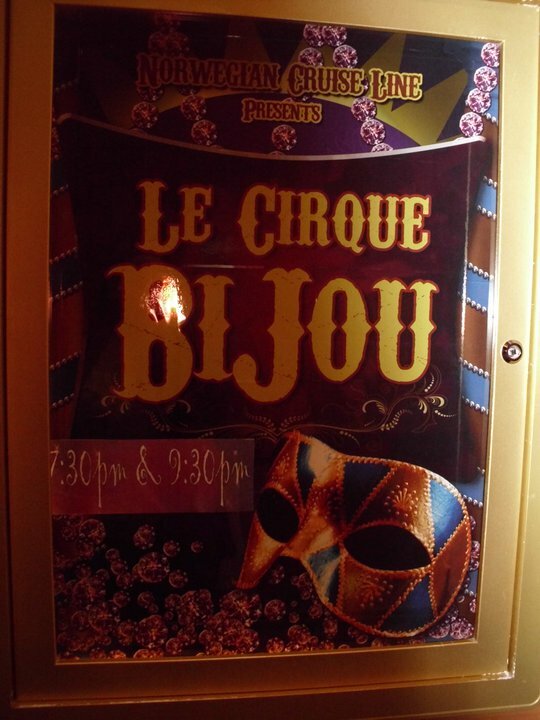 We saw Duo ArtMotion in the Stardust Theater and were absolutely blown away. A couple from the Ukraine, they perform complicated and dangerous aerial acts including tissue silks, a hollow box and rings. They were both so incredibly flexible, effortless and flawless. I was awestruck by the end. 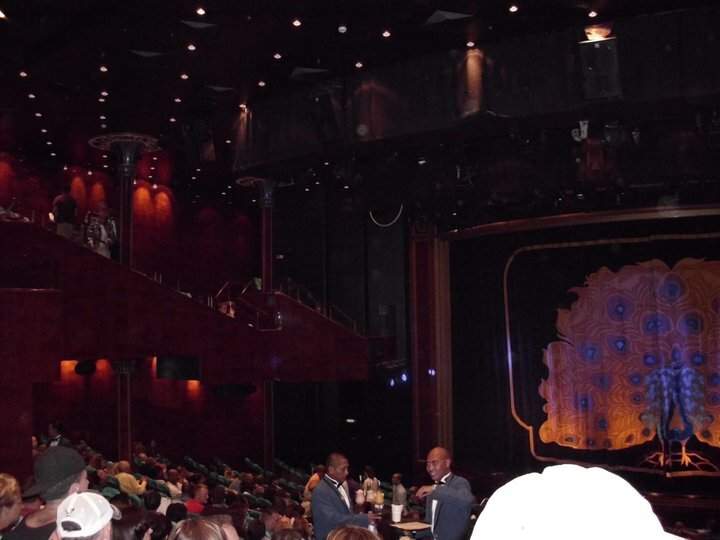 Other shows we saw on the ship included “Band on the Run” which was a 70’s inspired dance and singing show, a comedy variety show and Le Cirque Bijou, a mixture of dance, gymnastics and aerial acts performed by the Jewel Production Cast and Duo ArtMotion. When Thursday rolled around, I was still burnt but not yet ready for my vacation to end. A whole day at sea, we again took advantage of lots of down time, some room service, a complimentary cooking class, dinner with the great couple we met while watching the Bruins games and a comedy-magic show of the famous Jean Pierre. Now, let me tell you… this guy was good. Better than good. At first, he draws you in with silly tricks, messing them up to make you think he doesn’t know what he is doing and then pulls the rug out from under you when he does something incredible. Like making a playing card appear IN an orange that matched the one a kid pulled out the deck earlier in the show. I can’t even explain it. 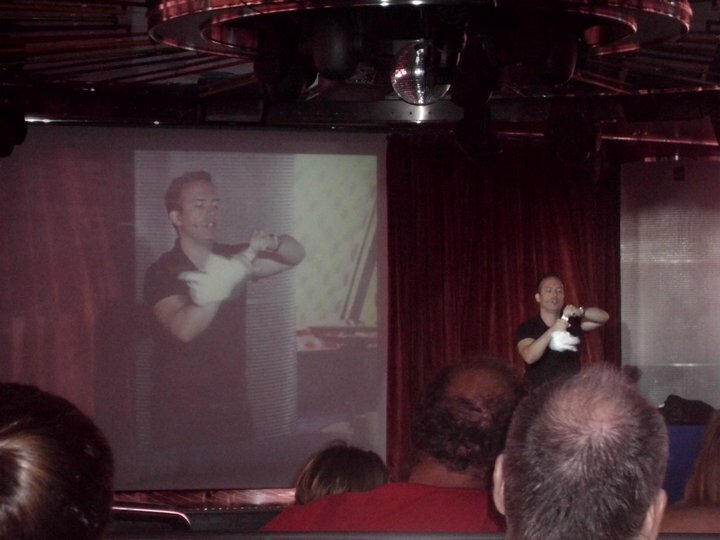 He was hysterical and I loved seeing him, not once, not twice but four times throughout the cruise. And when JP tours in Boston, you know Stephen and I will be there. 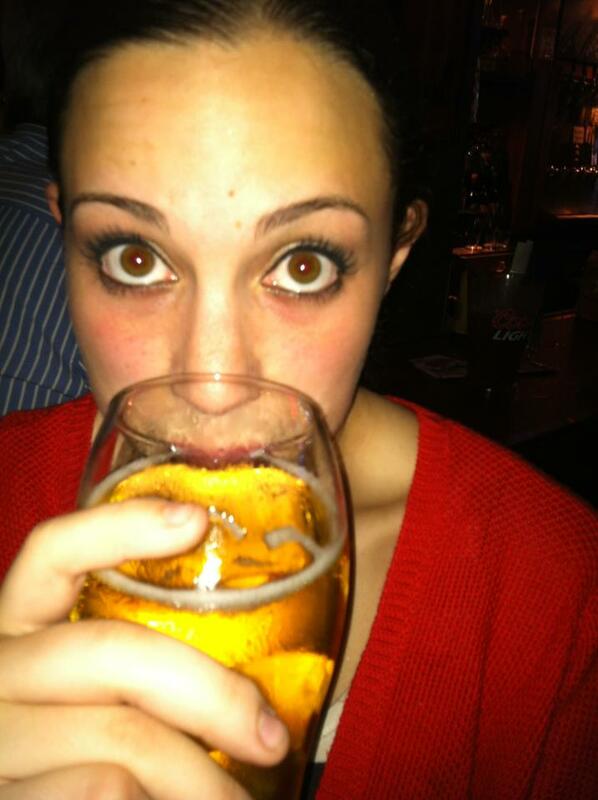 Thursday night was dedicated to one thing: ASTI. For those of you who don’t know, Asti Spumonti is an Italian sparkling white wine, very similiar to champagne and Stephen and I LOVE it. We brought a huge bottle on board (yes, it was legal) and planned on drinking it all on Thursday night. Which we did… and promptly fell asleep afterwards. 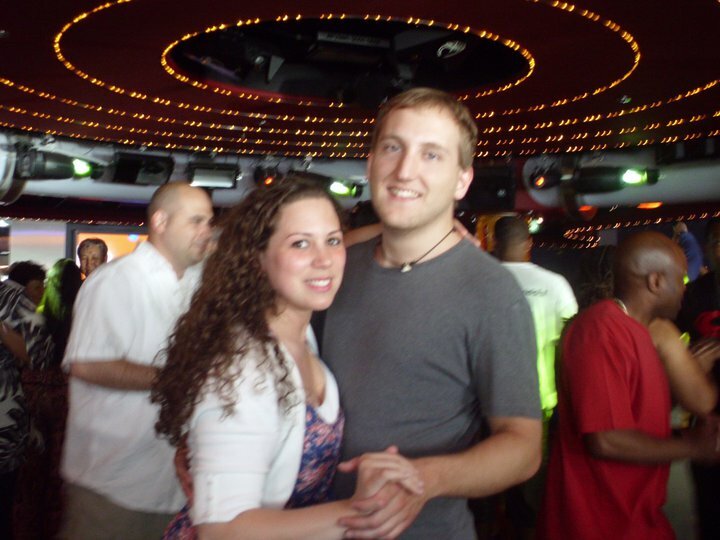 Our last day at sea, Friday, was cooler as our ship tugged back up the east coast but there was still plenty of fun left. We bought more souvenirs including an 8-year aged bottle of rum that was made in the Bahamas. Stephen and I spent a little more time in the sun, I finished my book and started another and for dinner, we made reservations at one of the specialty restaurants on board: Sushi. It was incredible but more about that in my next post! To finish the night, the adult lounge on the top deck hosted the game “The Quest: What Happens on the Jewel, Stays on the Jewel.” It was hilarious. They even got a bunch of the men in the audience to strip down to their underwear, put on bras, lipstick and women’s shoes and show off their dance moves. The guys on our team wouldn’t do it but hey, I wouldn’t have done it either! Saturday morning eventually had to come and by 8am, we were docked NYC and back to reality. Tan (burnt), relaxed and happy, we made the bus trip back to Boston in time to see the end of the Bruins parade trickle out. 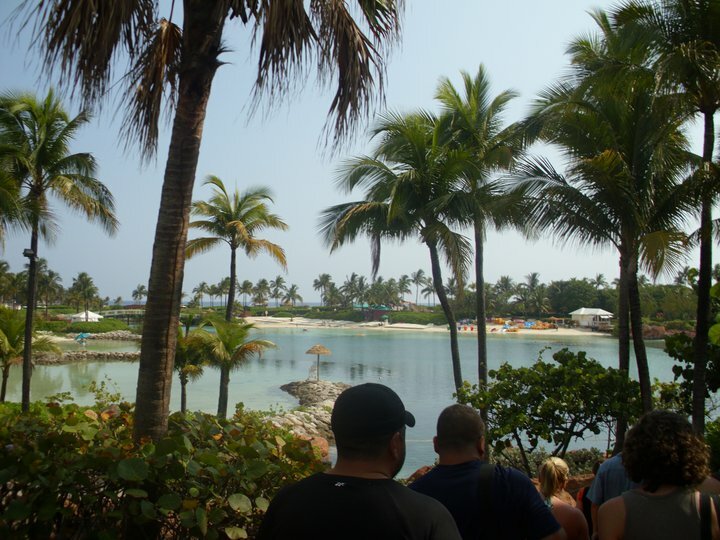 It was an amazing vacation… we can’t wait to take another! Happy Monday to everyone. Sad to be back to reality but glad to be back to the blog!